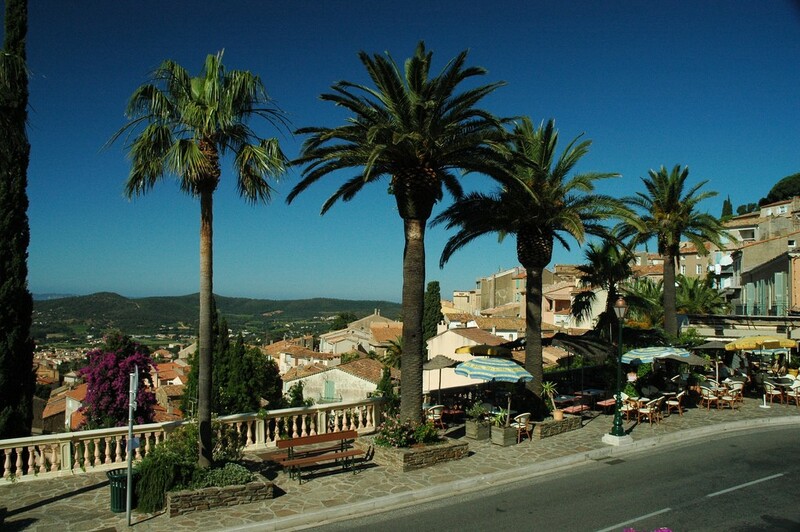 One of the most beautiful regions between the French Provence and the Riviera is the village of Bormes-les-Mimosas. The flower called Mimosa has given its name to the area since 1968. 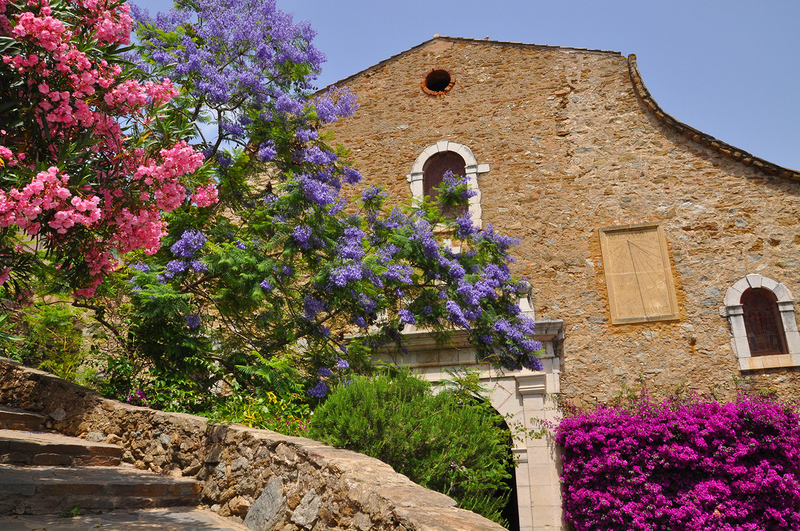 Bormes is surrounded by incredible stone coves, charming towns and cities and stunning beaches. The colours are vibrant at the right time of the year with the purple of lavender and the yellow of mimosa flowers. 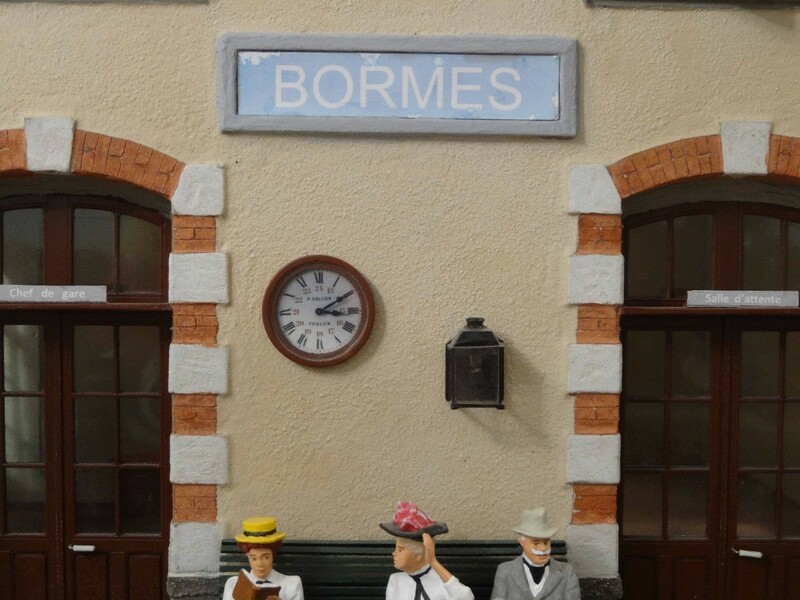 Our railway journey on from Bormes will start soon, but first a quick look round the small town. We take in a number of the tourist sights …. 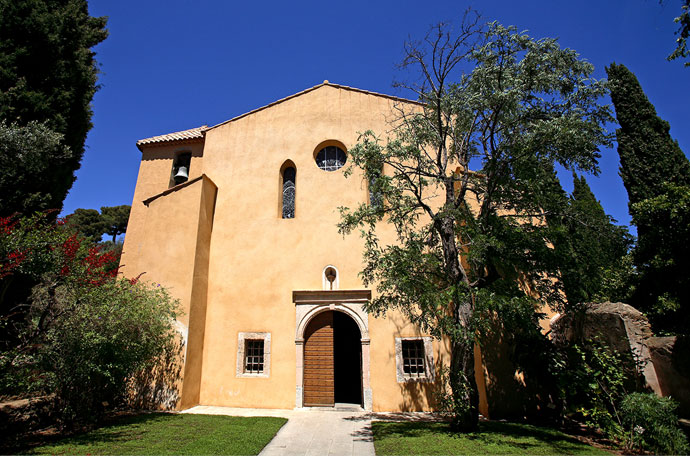 The Church of Saint Trophyme, built in the eighteenth century and inspired by old Roman architecture. The ruins of the castle of the Lords of Fos. The Chapel of Notre Dame de Constance has tremendous views from its height, 324 metres above sea-level. 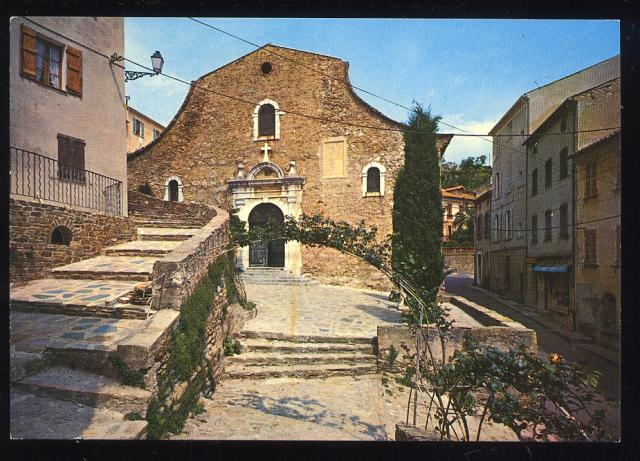 A Romanesque building, was built in the 12th century by the Carthusians of the Verne at the request of Constance de Provence, daughter of Robert the Pious. It can be reached by the path lined with oratories which begins behind the castle. 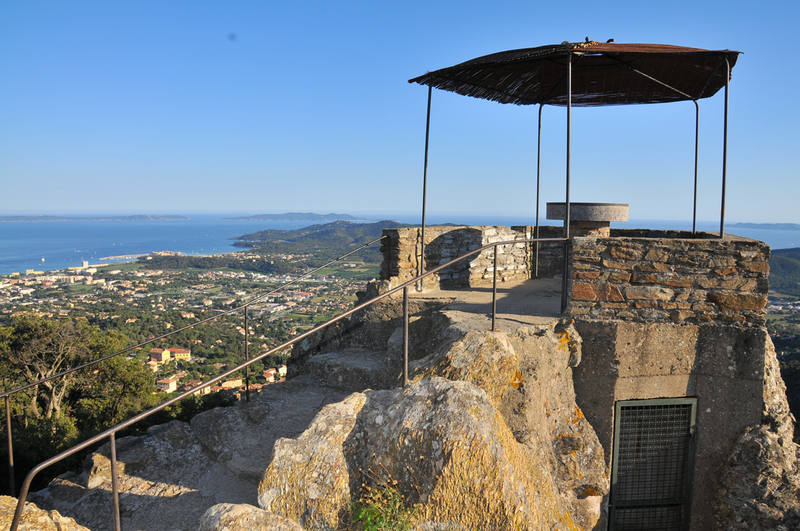 From the chapel there is a panoramic view of the village and the islands of Hyères. There are squares with fountains, nice shops, art galleries and workshops. 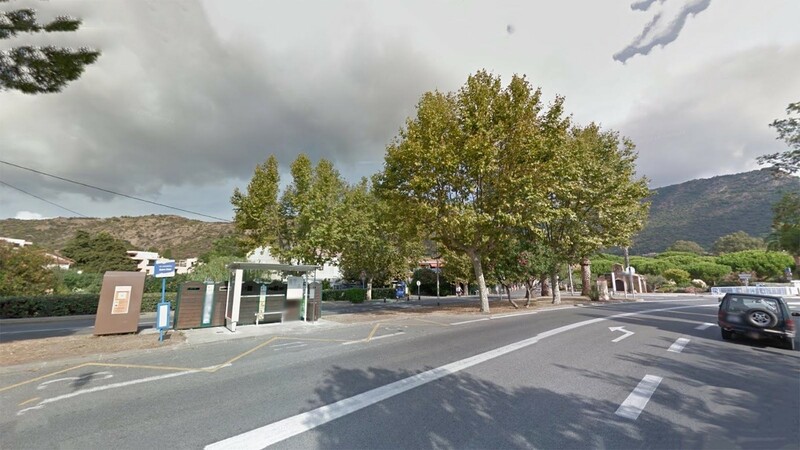 We take in the Square of L’Isclou d’Amour, Lou Poulid Cantoun square, square Figuier and des Amoureux square. 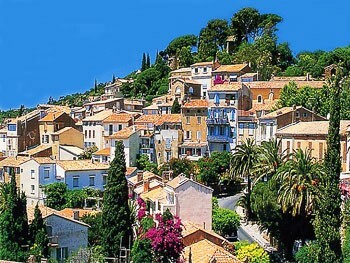 The old town of Bormes -les -Mimosas has small terracotta coloured houses, provincial windows, stone paths and spectacular sea views. 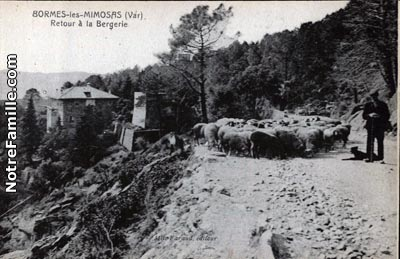 We cannot dwell too long, but we do want to see what the village looked like around a century ago and so we look at a number of old postcard views before getting back to the railway station. Just a few great views of the village! Now back to our journey! Sadly, the station is no more and the site has been redeveloped for housing. But we can dream …. Dreaming is OK, modelling is better. 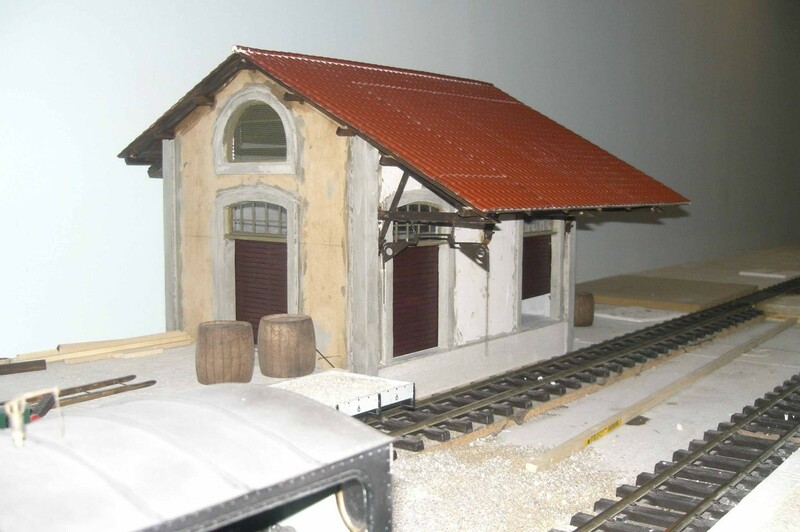 Why not explore http://www.trains-littoral.fr. 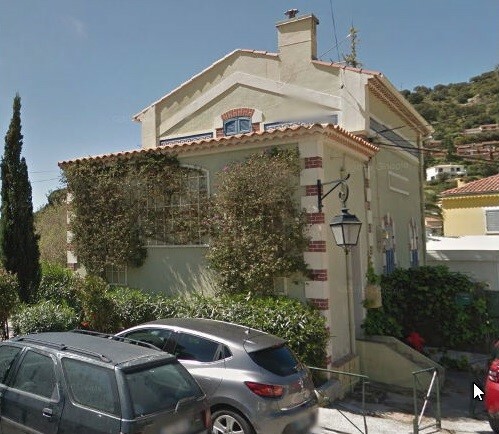 This is the site of Henri Lacube who has made a relatively large scale model of Bormes station. Just a few images here. 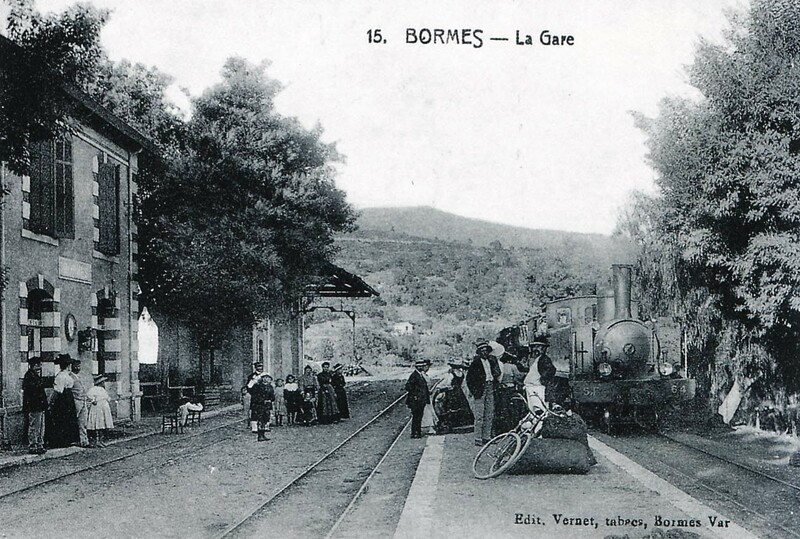 Just for clarity for our purposes here, there were no tunnels close to Bormes-les-Mimosas station, nor was there a locomotive depot. 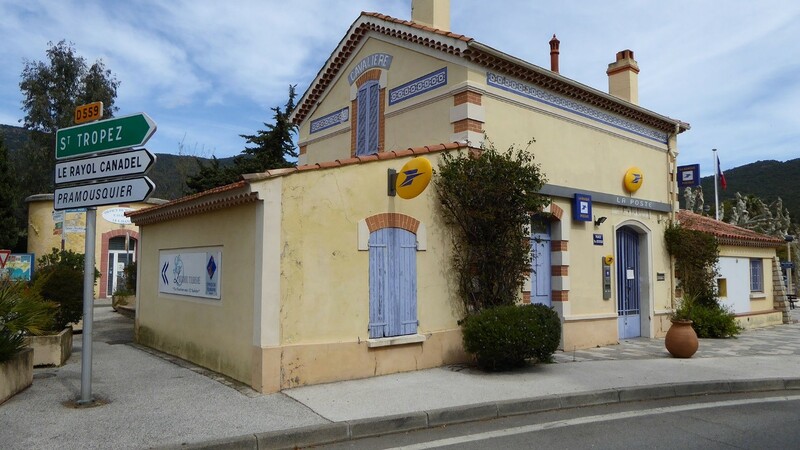 The depot pictures are reproduced here so that a good impression can be gained of the motive power on the Chemin de Fer du Sud de la France Littoral in the days of steam. 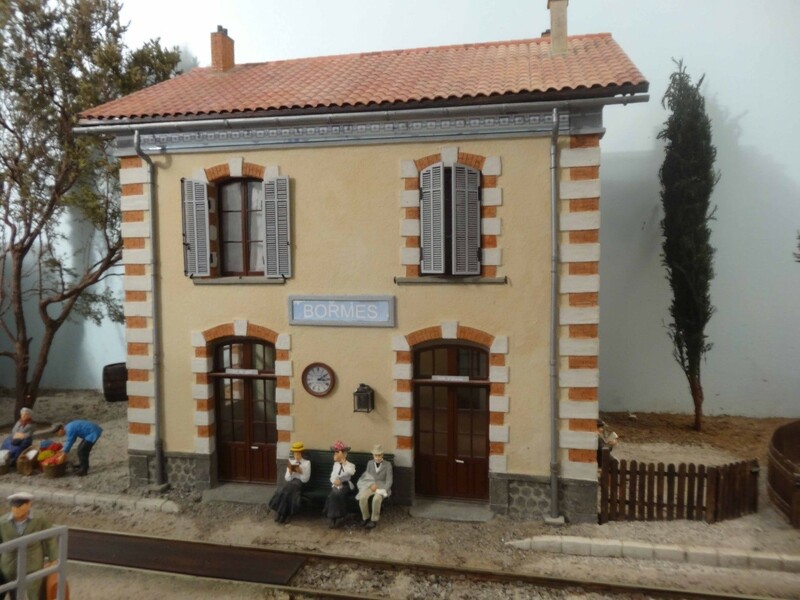 The station plan is a mirror image of what was on the ground in Bormes, nonetheless it really does help us to feel present at the station. 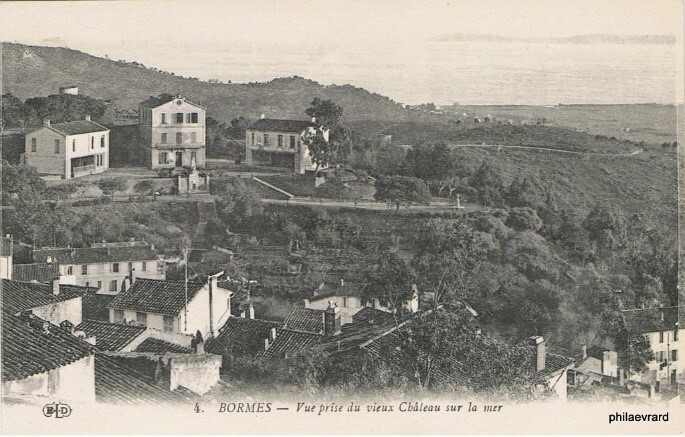 Bormes-les-Mimosas applied for the railway in 1882. 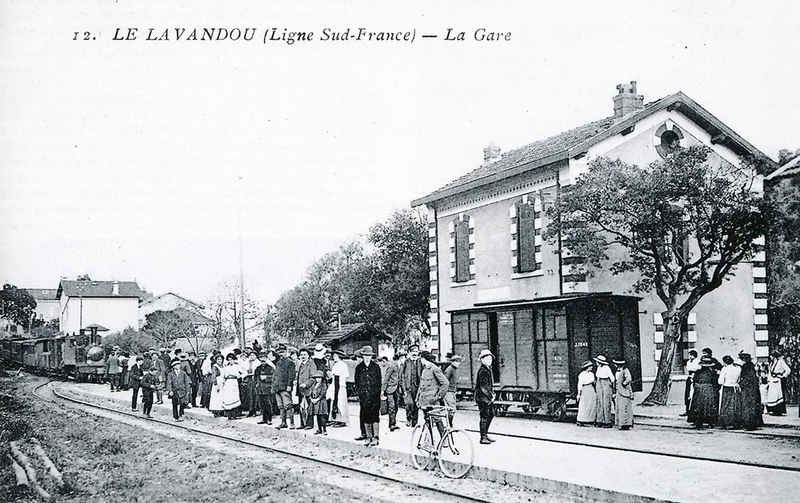 The commune paid a grant of 40000 francs to ensure that it had its own station and did not have to share with Le Lavandou. 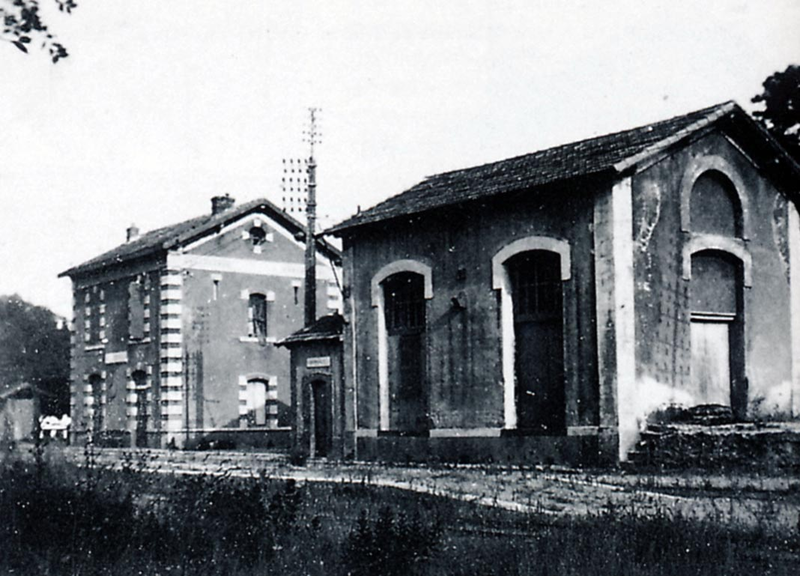 Station opened in 1890, building of 3 rd class, goods hall, two main tracks and a goods track. 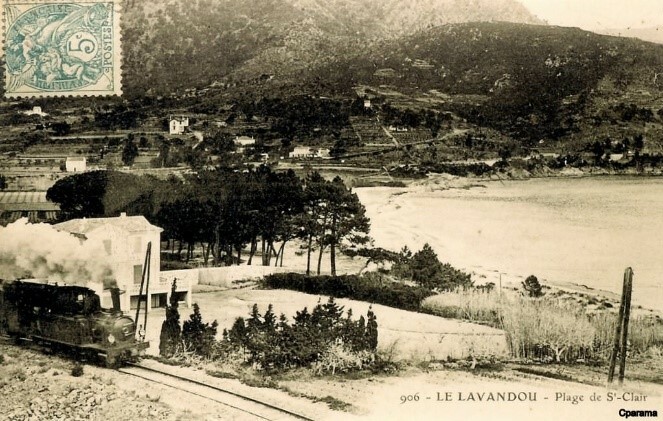 Trains left Bormes along the line towards La Lavandou following what is now called Le Chemin du Train des Pignes, parallel to and north of the present D559, through a small halt called La Favière which opened in 1937 and closed with the line. Nothing of this stop remains. 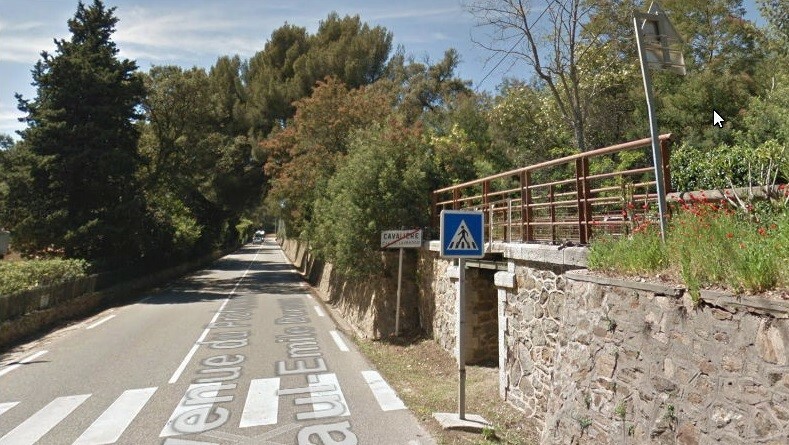 Soon after La Favière the line drifts down to run alongside the modern D559 and then follows Avenue de Provence into the town of Le Lavandou. The satellite image below shows the location of the station. It now forms the main bus station for the town. 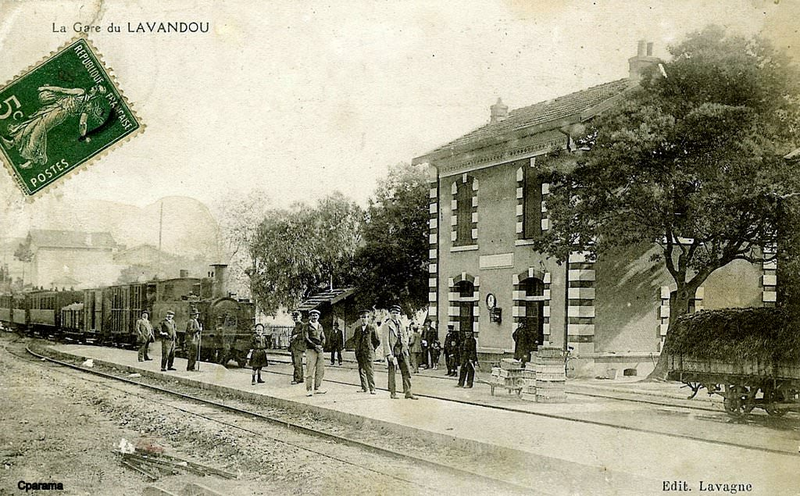 In the image below, around 1910, a mixed train from St.Raphaël to Toulon enters the station of Le Lavandou where a crowd of travellers are waiting. Routinely there were around 2000 passengers per day during the busiest periods of the year. 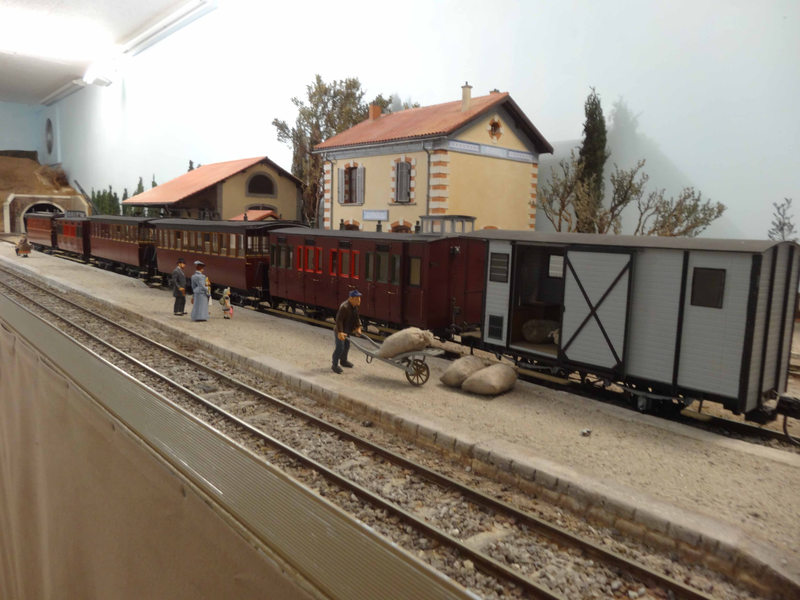 In front of the station building is the boxcar J-1242 (De Dietrich 1905), on the roof there is a footway through which the allows access to the oil lamp illuminating the interior of the wagon (Jean-Pierre VIGUIE Collection). 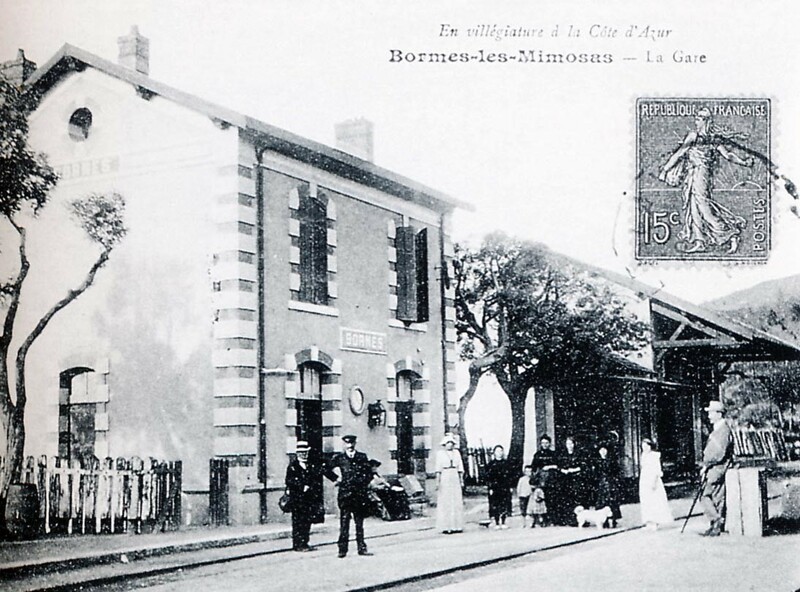 This is an earlier image of the station, probably from the last years of the 19th Century (Pierre LECROULANT Collection). 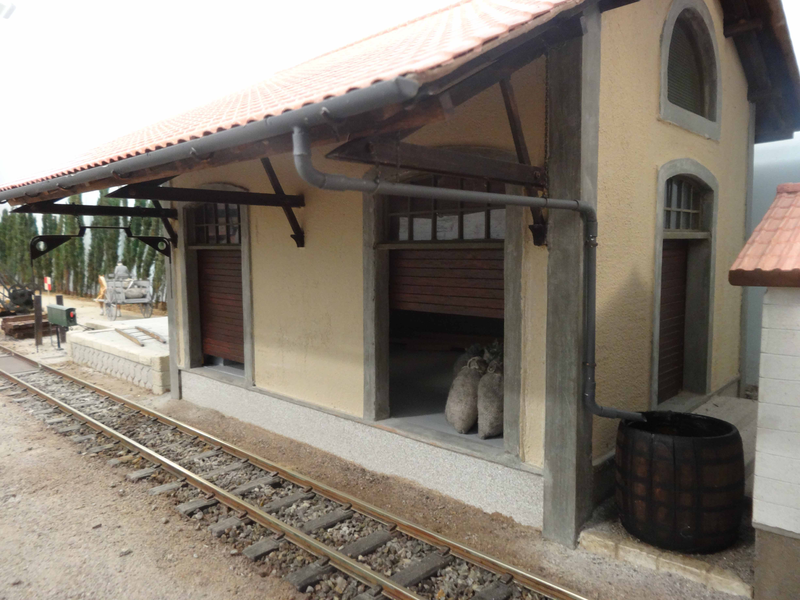 The image below is a good train carrying fruit and grapes in wooden crates as seen on the platform. 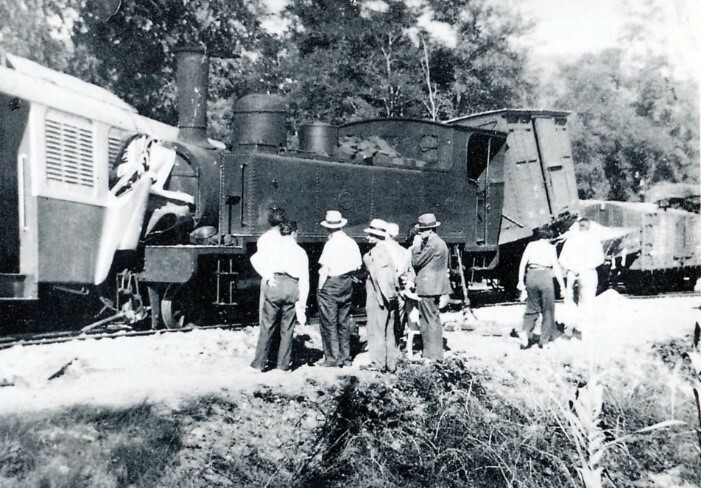 The locomotive is 4-6-0T series 61 to 66 (Jean-Pierre VIGUIE Collection). 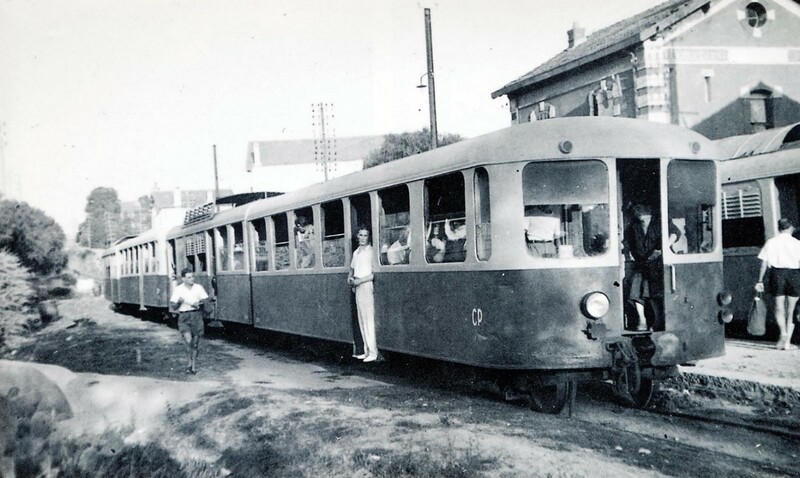 In the last years of the line, after the War and before closure in 1948, services were maintained by railcars. The image below was taken on 30th August 1947. 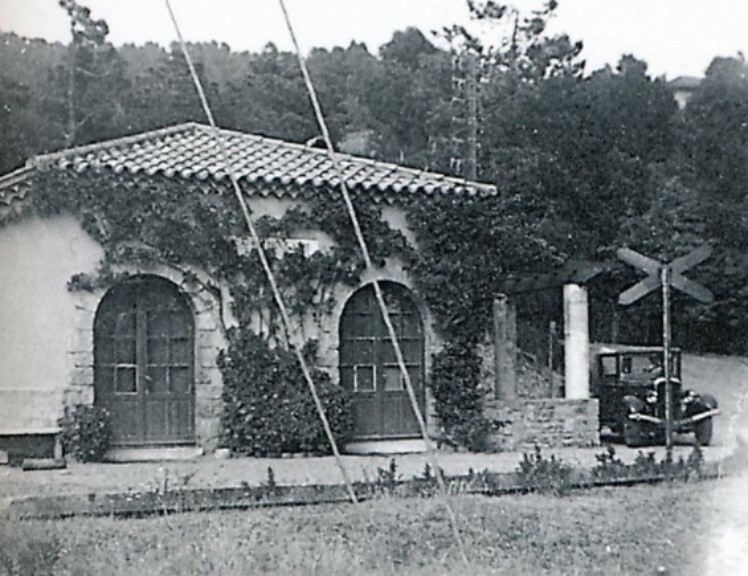 The good shed and station building at Le Lavandou in its final state after the closure of the line in 1948 (Photo Marcel CAUVIN). In the 1970s the building was converted into a bus station. Leaving the main station in La Lavadou the train travelled through the town and a stop was provided on the line closer to the centre of the town. It opened in 1937 and closed with the line in 1948. 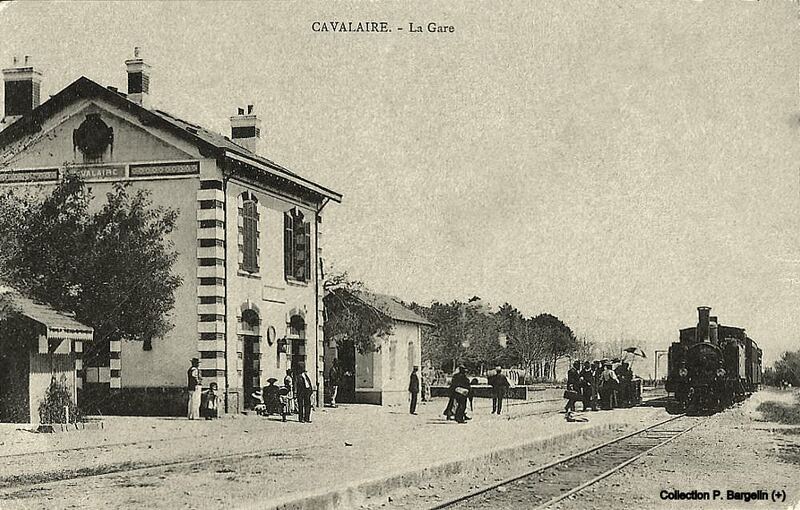 After the centre of Le Lavandou, the line parted company with the modern D559, travelling along the line of what is now called Avenue de la 1ere Div Fr Libre, as can be seen on the adjacent image. 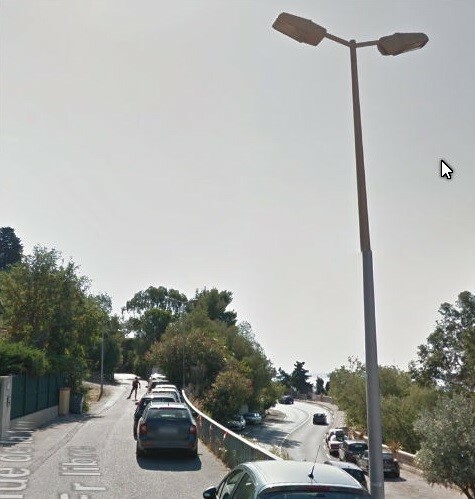 The D559 is below the line to the right.Avenue de la 1ere Div Fr Libre, as can be seen on the adjacent image. The D559 is below the line to the right. Its formation is then obliterated by a road tunnel which cuts the line and has its exit at a much lower level than the old line at Pilon de St. Clair. 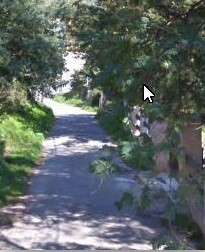 The next two pictures are taken at approximately this location. 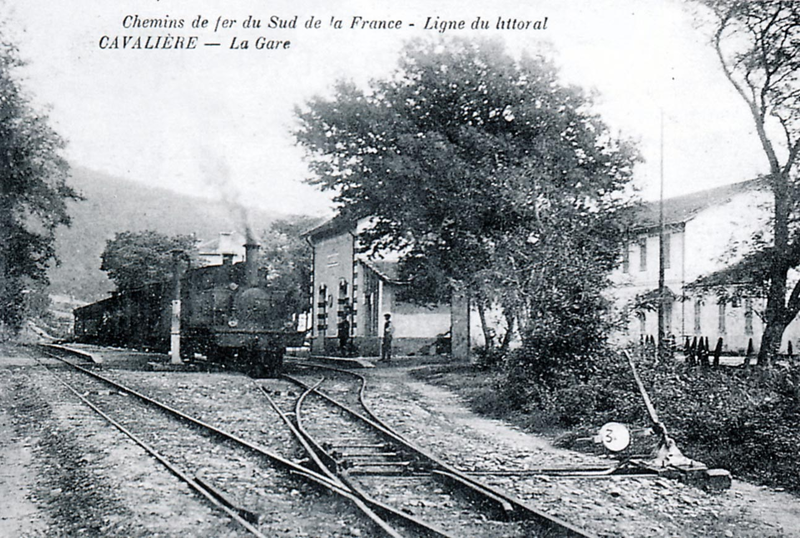 The line turns north to follow the coast-line, before reaching the Halt which served Saint-Clair. 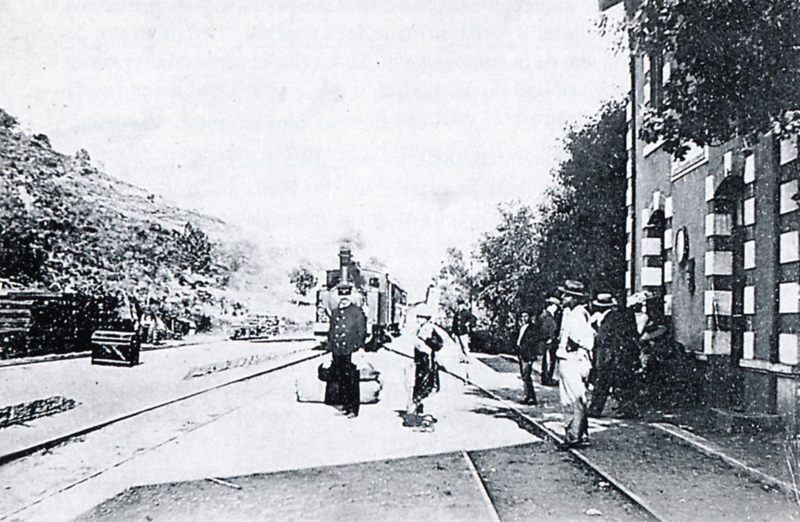 The halt was close to a level-crossing – the guardhouse is visible in the background. 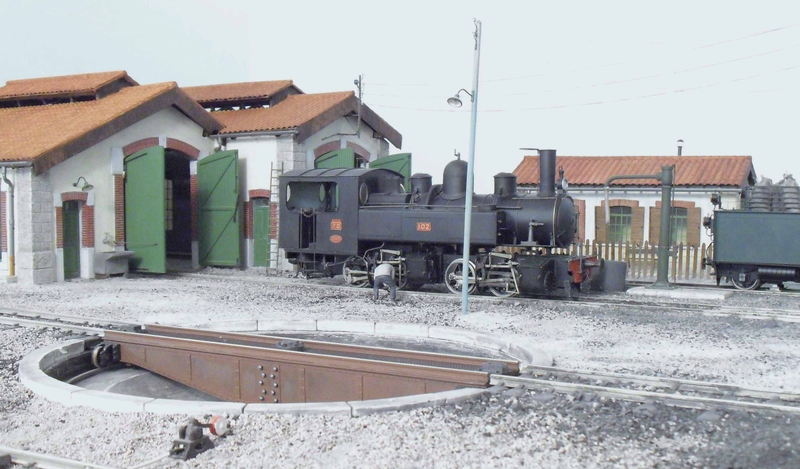 The locomotive is a 2-4-2T SACM from the initial series 51 to 56, commissioned for the opening the line (Raymond BERNARDI Collection). The bus-stop in the image below is in almost exactly the same location as the halt. 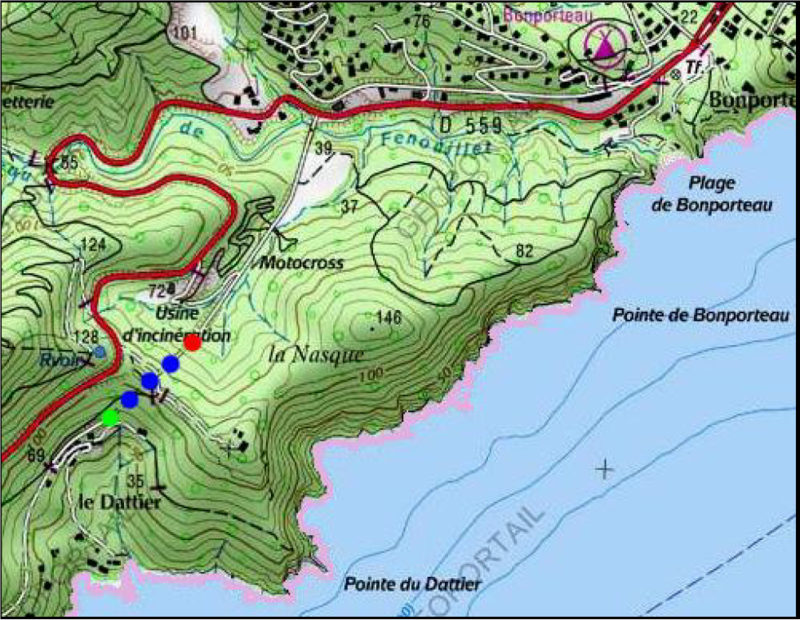 After the halt, the line turned sharply East and then hugged the coast-line before reaching La Fossette-Aiguebelle (originally La Fossette). The building remains intact. 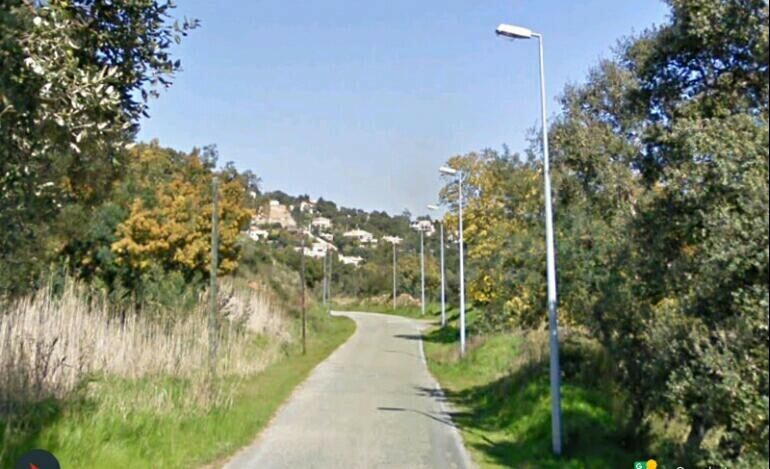 The line followed the modern cycleway, La Fossette and the building can be seen alongside the route. Photo Fr. Latreille March 2010 (Wikipedia) – A close up of the building with ornamentation typical of buildings in Provence, a corner of red brick angles alternated with white stone and a band of blue ceramic tiles to surround the top of the facade and gables. 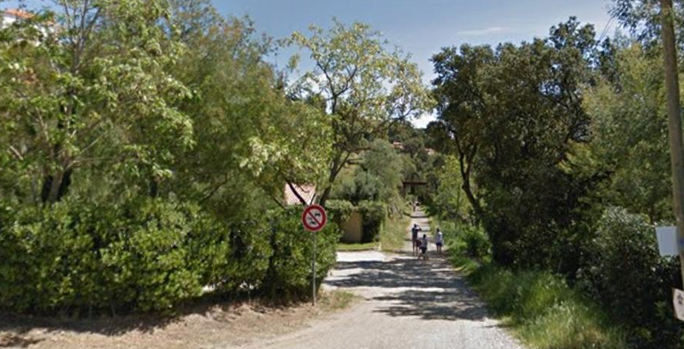 Then the cycleway continues along the line of the old railway with the name La Fossette and following relatively closely the line of the D559 towards the next halt at Aiguebelle-Plage. In the photo below, from the 1930s, the crossing keeper was preparing, red flag in hand, to close the chains of the level-crossing close to the Aiguebelle-Plage stop (Raymond BERNARDI Collection). 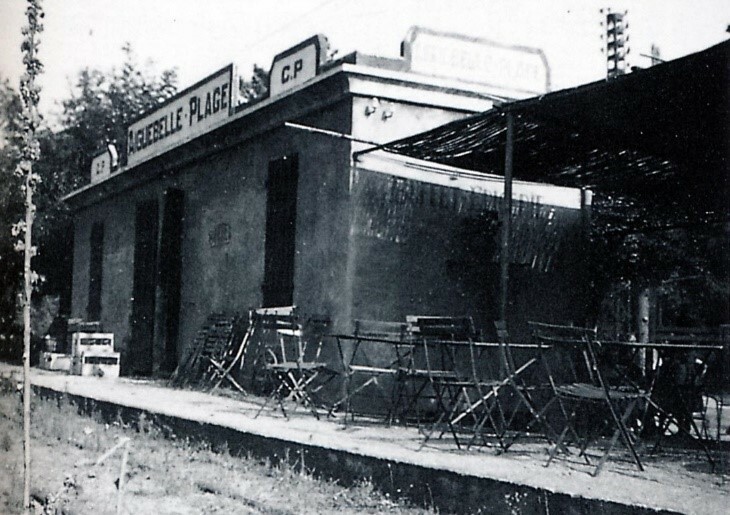 The following image is of the café and grocery store which formed the buildings at the stop. By the time the line left the halt, it alignment relative to the D559 had changed. 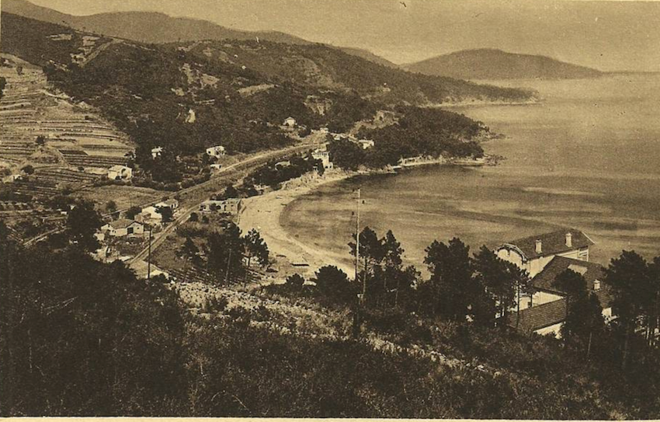 It now ran on the south side of the road, closer to the beach until the Layet tunnel was reached. 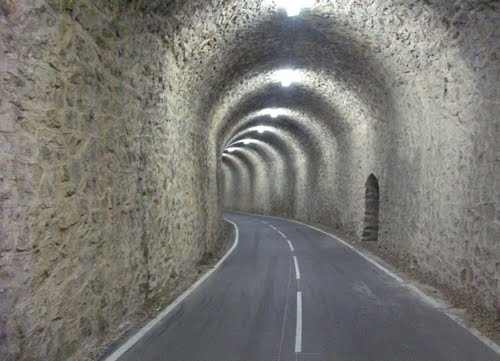 The tunnel is still in use, now as a cycleway. 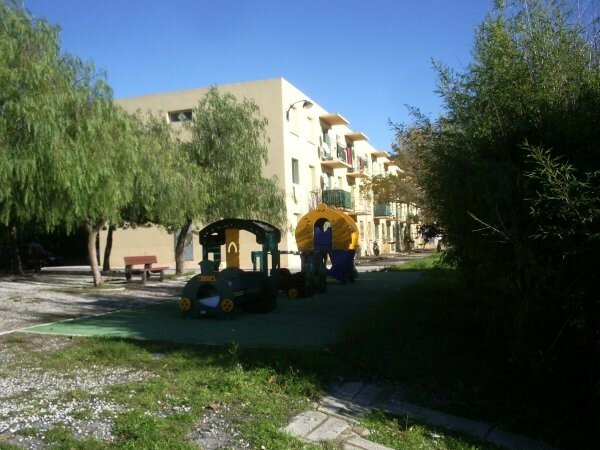 It is a little under 170 metres long and curved in layout. 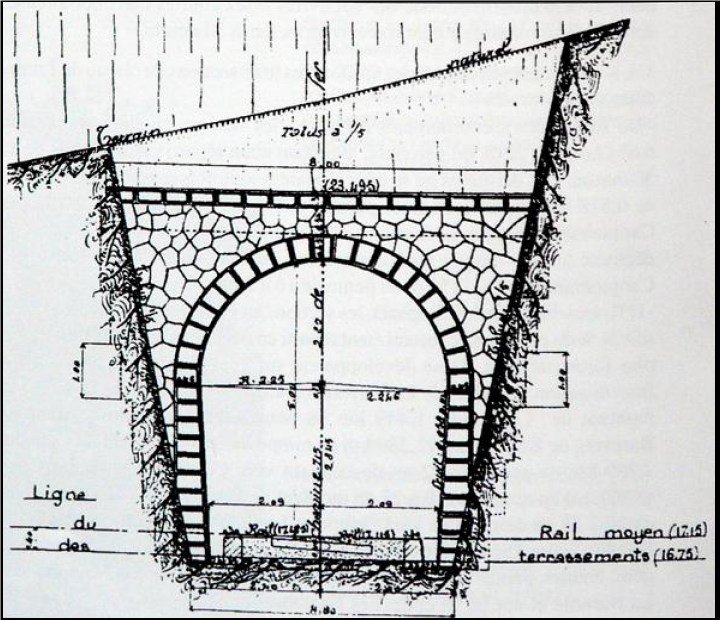 The entry and exit portals were identical with some significant retaining walls on the approaches at either end. 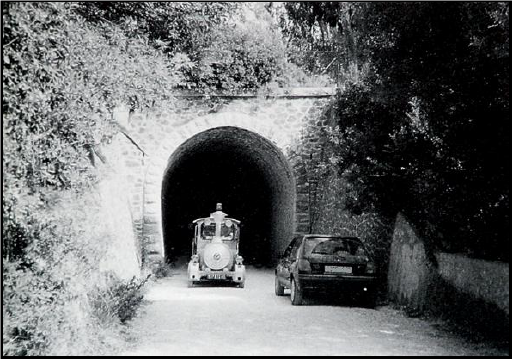 Research has resulted in one image of a train entering the Eastern portal of the tunnel travelling towards Toulon which can be seen below. 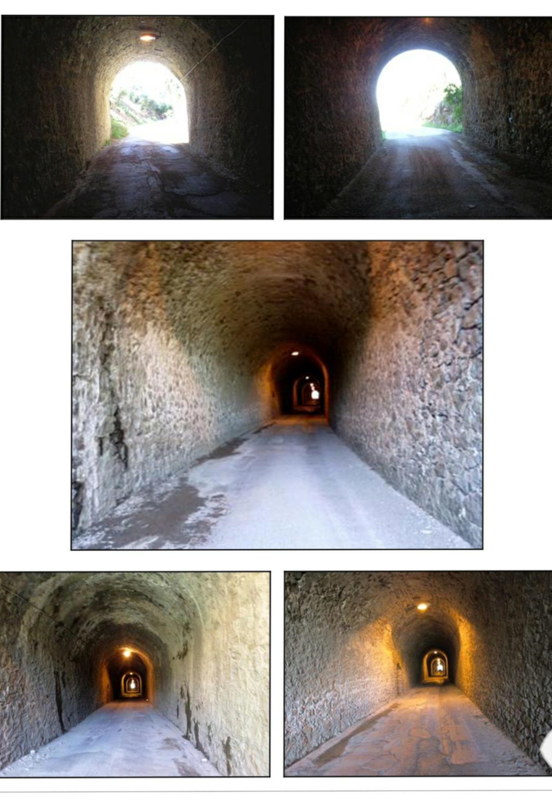 Photographs of the tunnel follow the image below. 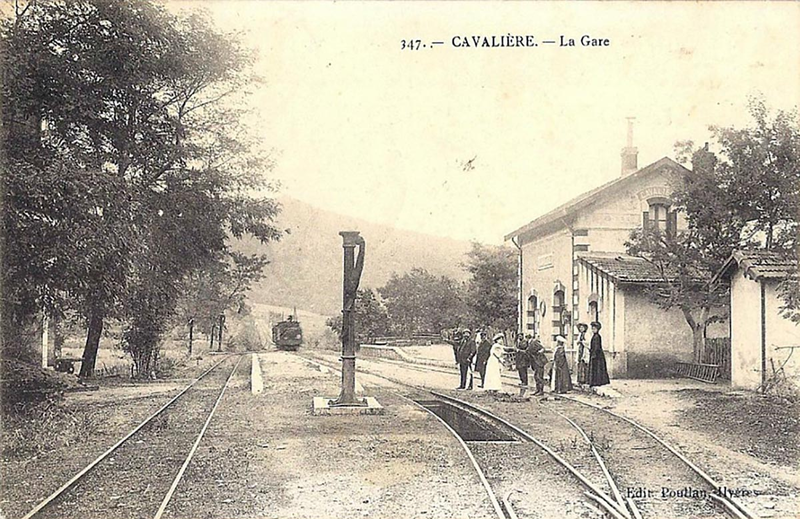 After the tunnel the railway followed the D559 towards Cavalière. 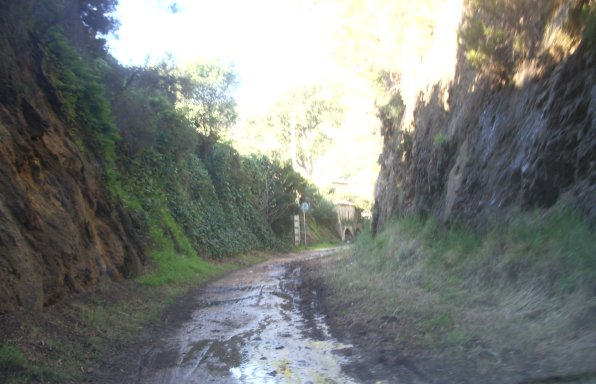 The track formation continues to be used as a cycleway and sits between 1.5 metres and 2 metres above the road on its north side. 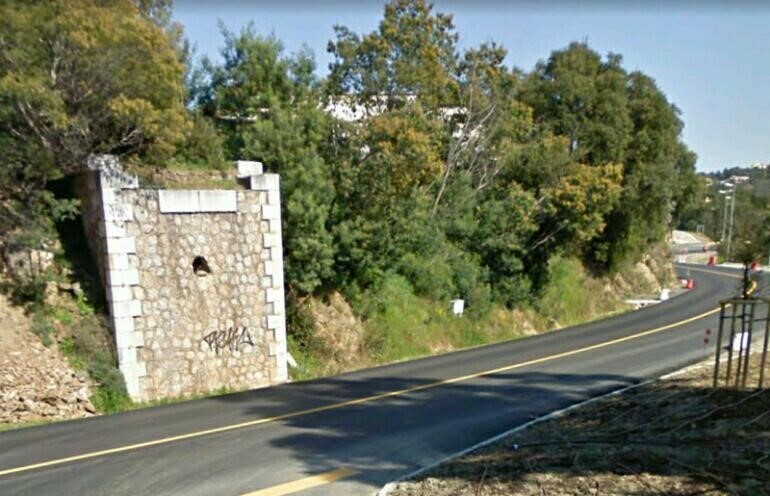 There is an original underpass just at the western boundary of the village of Cavalière. 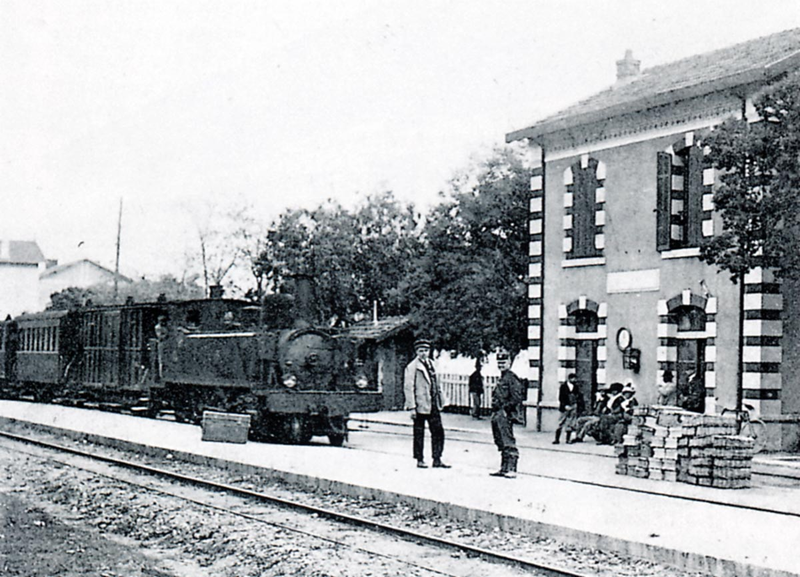 Cavalière Station buildings are still present and are the village post office. The platforms were on the North side of the buildings. 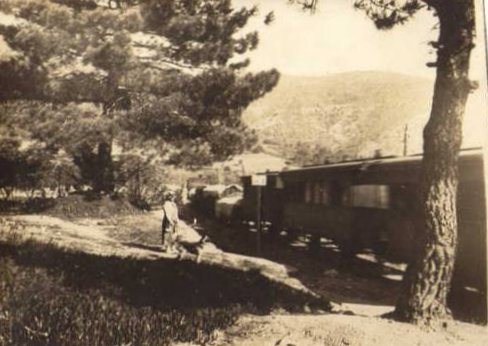 On 21st September 1935, the point visible at the bottom of the above photo (Collection Raymond BERNARDI) was the location of a collision between a steam locomotive and a railcar. 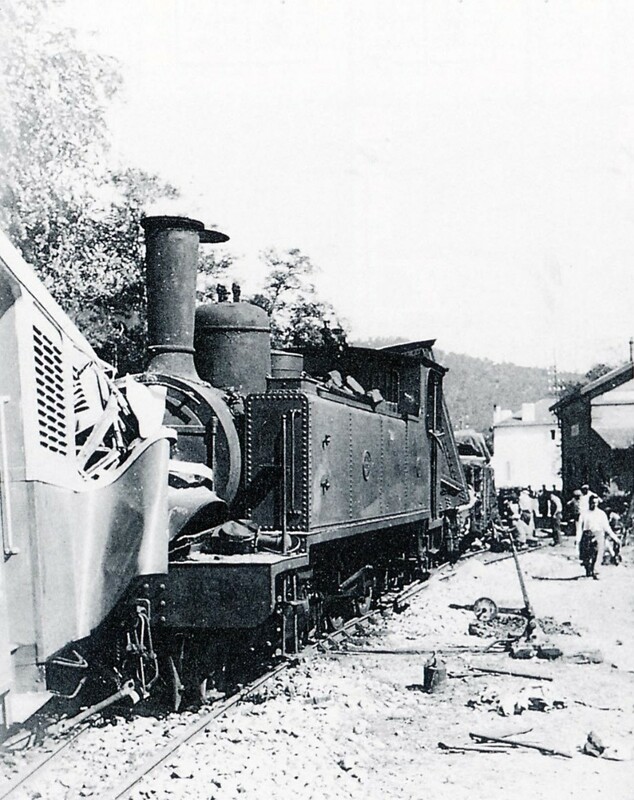 Photographs from the GECP Collection show the immediate aftermath of the accident which occurred because of a brake failure on the Frejus to Hyères goods train. 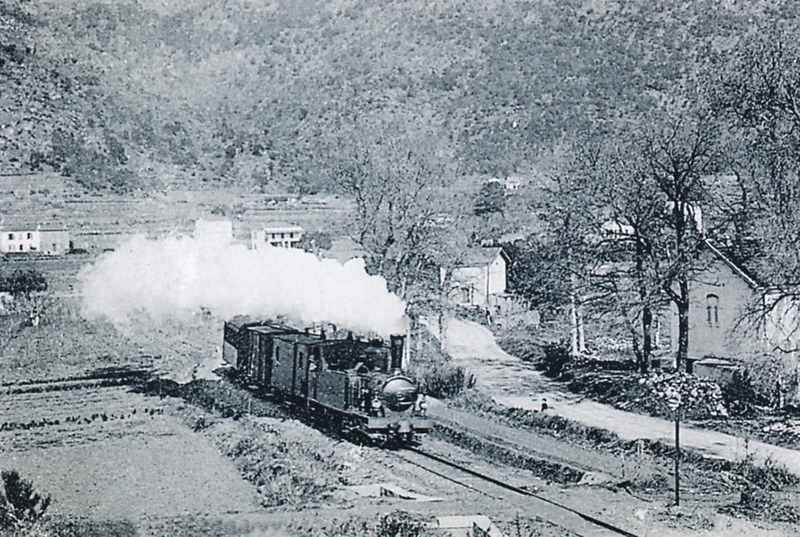 The locomotive was 4-6-0T No. 62. 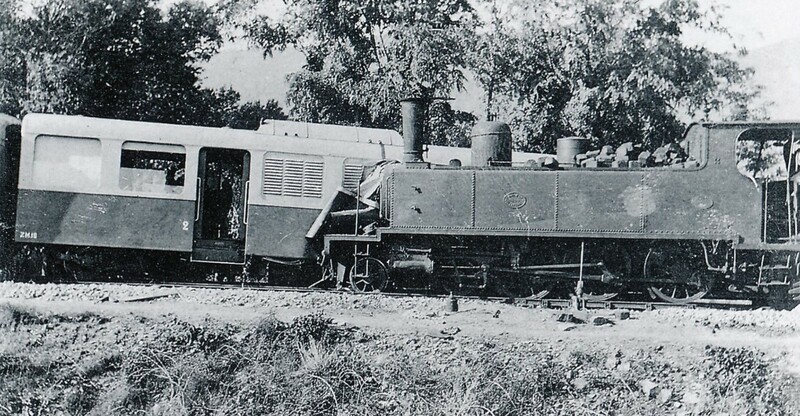 It passed the stopping position in the station and struck the Brissonneau & Lotz ZM-10 railcar, train 103 Toulon to St. Raphael. They would usually have passed at this station. Among the derailed vehicles of the freight train 182, depicted cons-car J-2141 De Dietrich and a flat car V series loaded with sand. 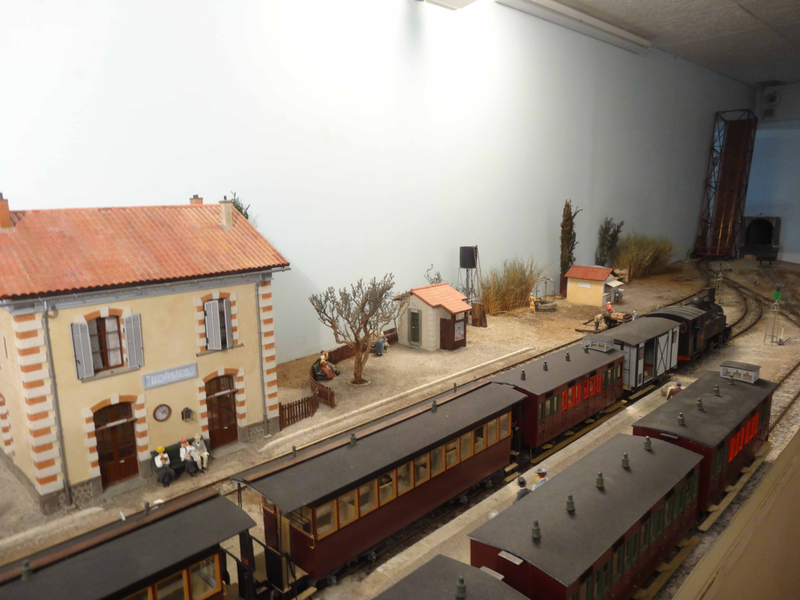 Among the thirty-three wounded were the drivers of the two trains and the mechanic Louis Coulomb who was thrown through the window of the railcar. 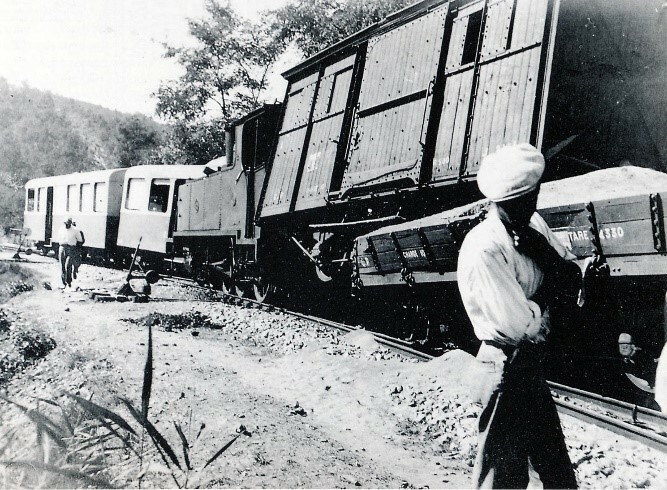 Two other railway staff were also injured. During the final years of the railway, immediately after the Second World War, the infrastructure never recovered from wartime neglect. The permanent way and the buildings were in a poor condition. During the last days of the operation, sidings were overgrown, even the mainline was neglected with grass growing between the sleepers. 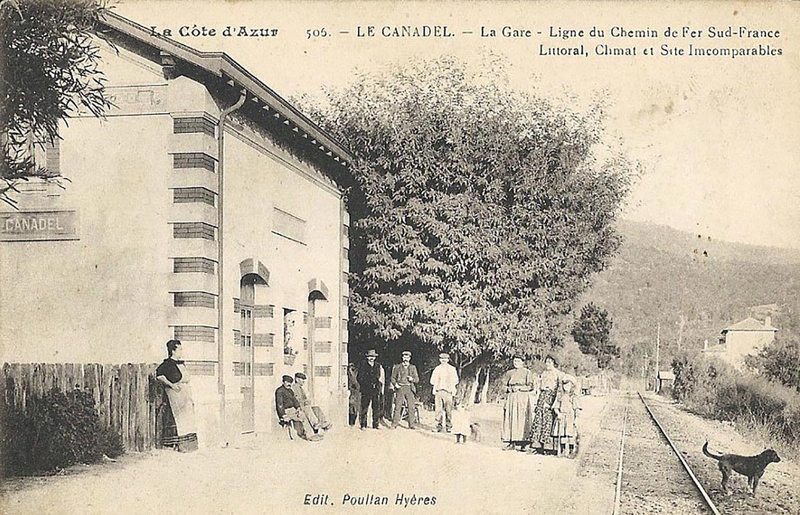 This final picture of Cavalière Station makes this abundantly clear (Photo Marcel CAUVIN – Bernard ROZE collection). 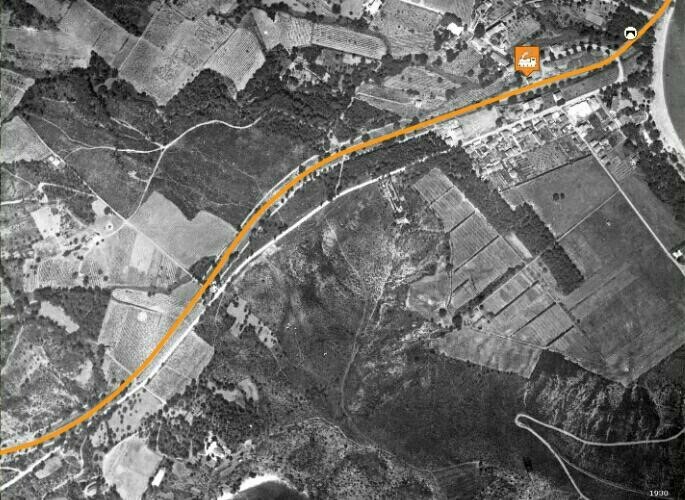 The line continues on East from Cavalière on the north side of the modern D559 through a small halt at Cape-Negre, most of the way the formation is next to the road and perhaps 1.2 to 1.5 metres above the modern carriageway. It continues on through Pramousquier. 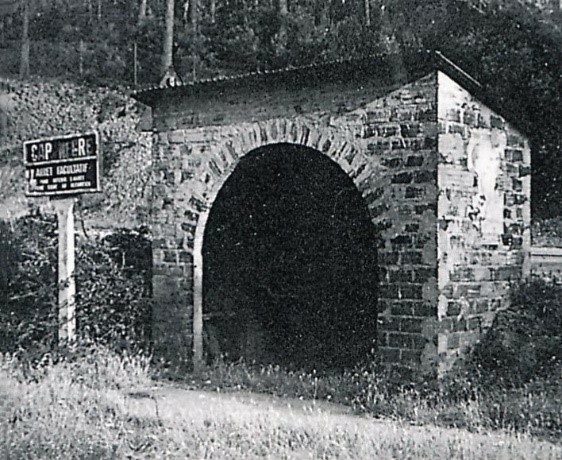 At Pramousquier, a small halt preceded the line going into a deep cutting (seen in the first colour image below) and under the road. 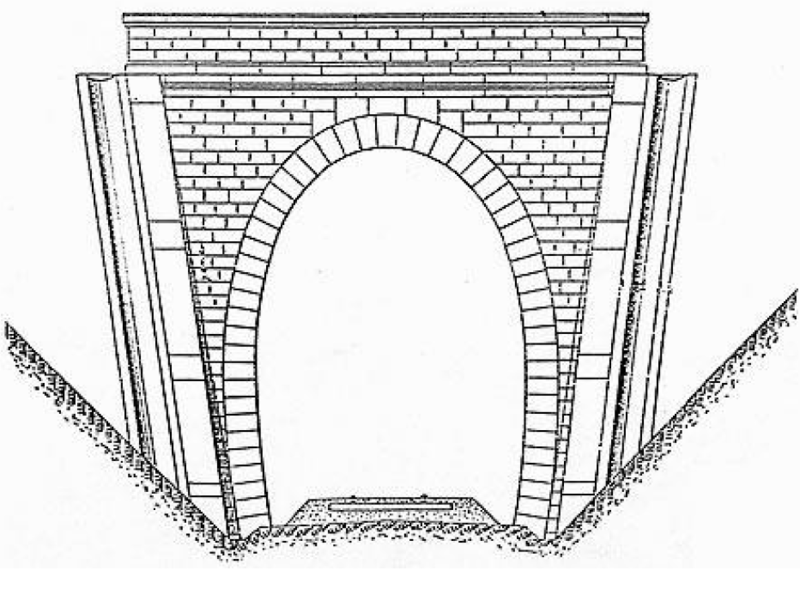 It emerged under the bridge which can be seen in the secodn colour image below before running along below the road on an arch vaulted (arcaded) retaining wall (Photo Marcel CAUVIN). The route continues hugging the coast-line below the D559. It is given the name Pramousquier but is no longer paved. 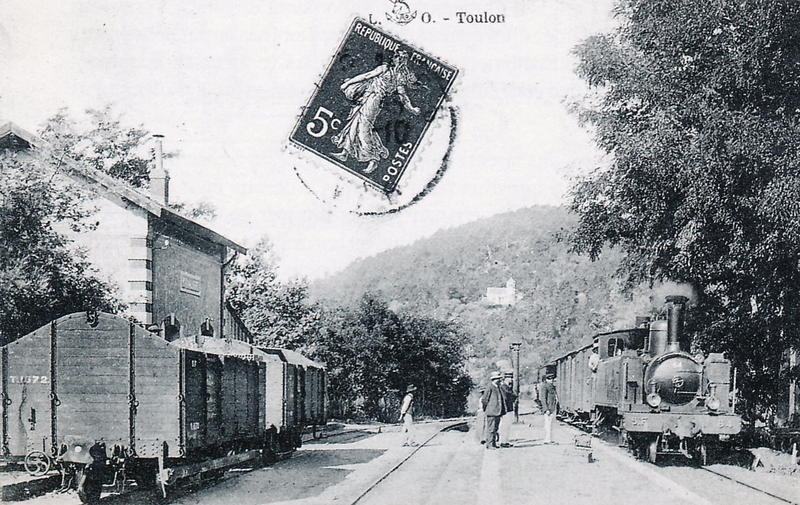 The arrow on this image shows the formation of the line looking back towards Toulon. 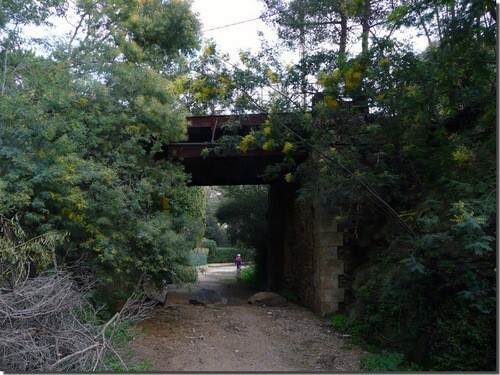 The smaller image is also taken looking back along the line towards Toulon from close to Le Canadel Halt. Canadel Halt has completel y disappeared. 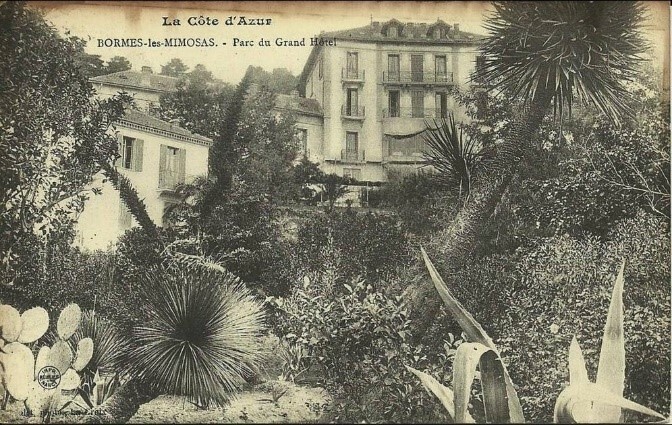 Its location is shown in the modern photograph below. It was destroyed in the bombing associated with the 1944 allied landings in Southern France. 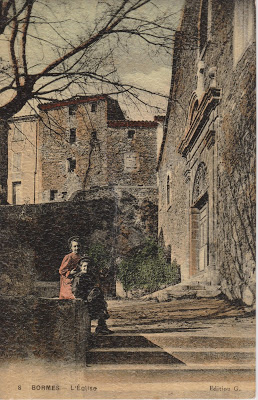 On the night of 15th August 1944, the Canadel Halt was the scene of the first contact between the commandos that landed in Provence and French civilians (Christiane CHATON collection). 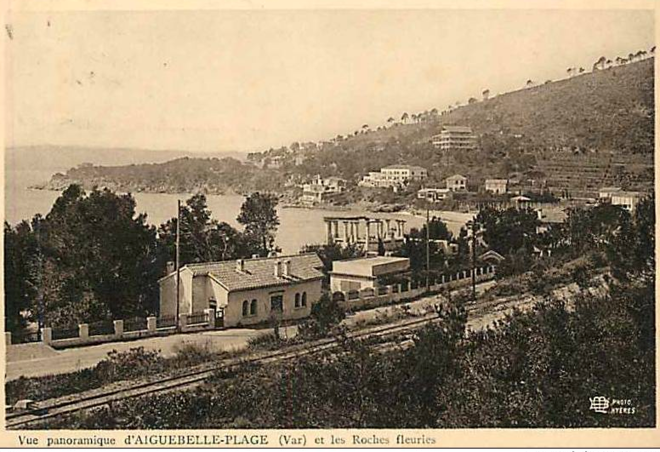 Cavalaire beach was used during the Allied landings in Provence. Operation Dragoon (initially Operation Anvil) was the code name for the Allied invasion of Southern France on 15 August 1944. The operation was initially planned to be executed in conjunctio n with Operation Overlord, the Allied landing in the Normandy, but the lack of available resources led to a cancellation of the second landing. By July 1944 the landing was reconsidered, as the clogged-up ports in Normandy did not have the capacity to adequately supply the Allied forces. Concurrently, the French High Command pushed for a revival of the operation that would include large numbers of French troops. As a result, the operation was finally approved in July to be executed in August. Landings took place along the coast from Saint-Raphael to Cape Negre on 15th August and Marseilles and Toulon had been taken by 28th August 1944. 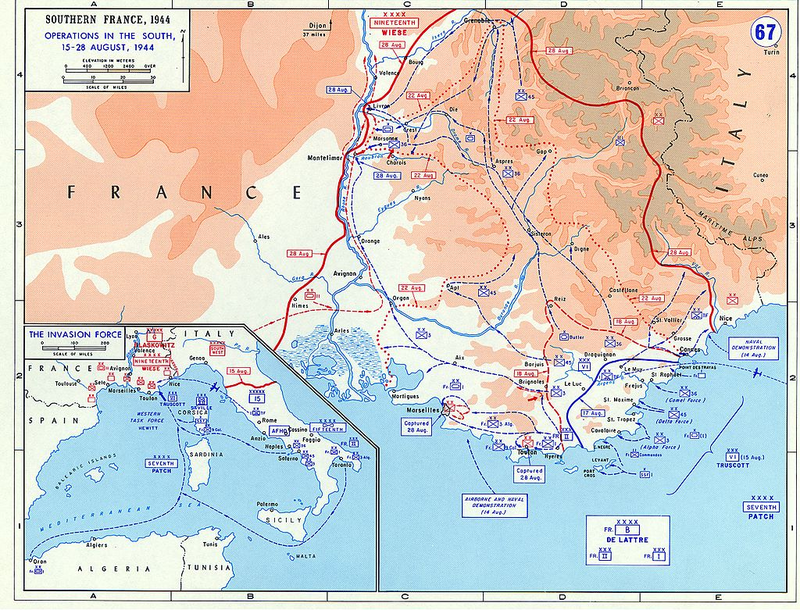 The goal of the operation was to secure the vital ports on the French Mediterranean coast and increase pressure on the German forces by opening another front. 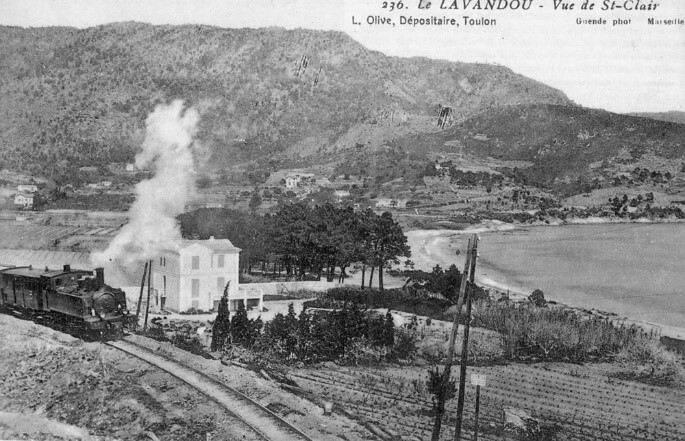 After some preliminary commando operations, including the British 2nd Para’s landing behind enemy lines to secure vital transport links, the US VI Corps landed on the beaches of the Côte d’Azur under the shield of a large naval task force, followed by several divisions of the French Army B. They were opposed by the scattered forces of the German Army Group G, which had been weakened by the relocation of its divisions to other fronts and the replacement of its soldiers with third-rate Ostlegionen outfitted with obsolete equipment. Hindered by total Allied air superiority and a large-scale uprising by the French Resistance, the weak German forces were swiftly defeated. The Germans decided to withdraw towards the north through the Rhône valley, to establish a stable defense line at Dijon. 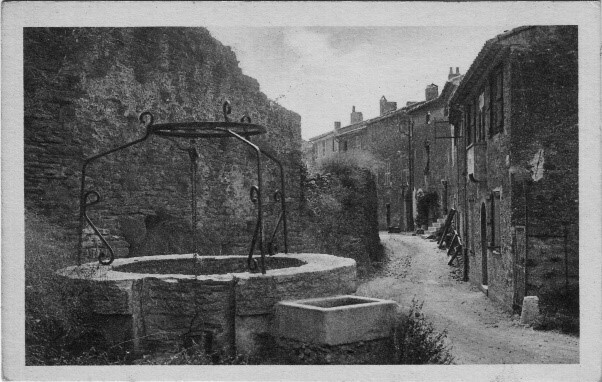 Allied mobile units were able to overtake the Germans and partially block their route at the town of Montélimar. The ensuing battle led to a stalemate, with neither side able to achieve a decisive breakthrough, until the Germans were finally able to complete their withdrawal and retreat from the town. 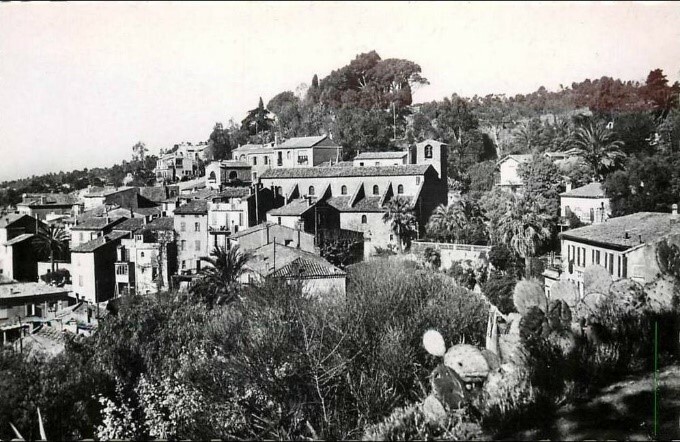 While the Germans were retreating, the French managed to capture the important ports of Marseille and Toulon, putting them into operation soon after. The Germans were not able to hold Dijon and ordered a complete withdrawal from Southern France. Army Group G retreated further north, pursued by Allied forces. 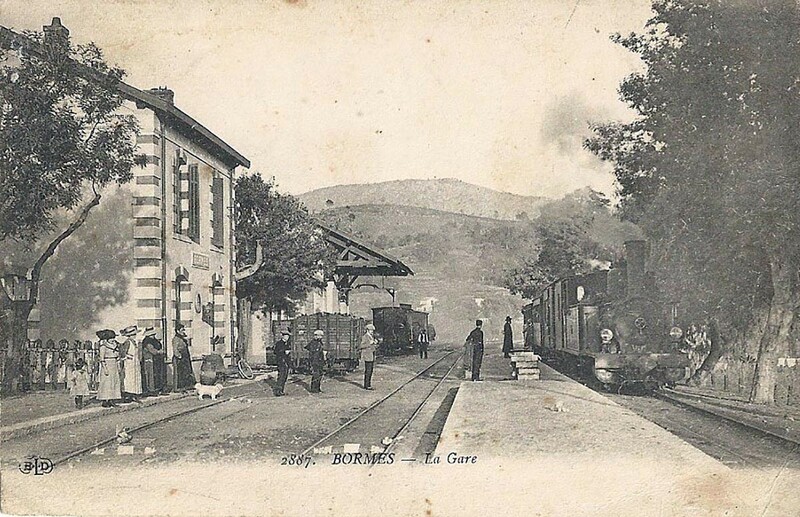 The fighting ultimately came to a stop at the Vosges mountains, where Army Group G was finally able to establish a stable defence line. After meeting with the Allied units from Operation Overlord, the Allied forces were in need of reorganizing and, facing stiffened German resistance, the offensive was halted on 14th September 1944. Operation Dragoon was considered a success by the Allies. 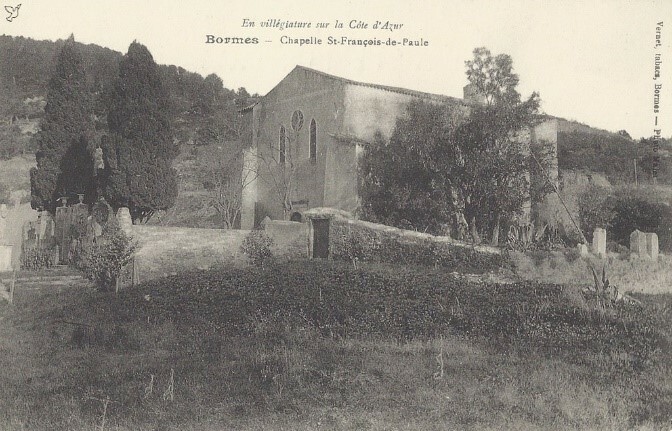 It enabled them to liberate most of Southern France in a time span of only four weeks, while inflicting heavy casualties on the German forces, although a substantial part of the best German units were able to escape. The captured French ports were put into operation, allowing the Allies to solve their supply problems soon after. On 15th August 1944, the main landing force consisted of three divisions of the VI Corps (The Sixth United States Army Group was an Allied Army Group that fought in the European Theatre of Operations during the Second World War). 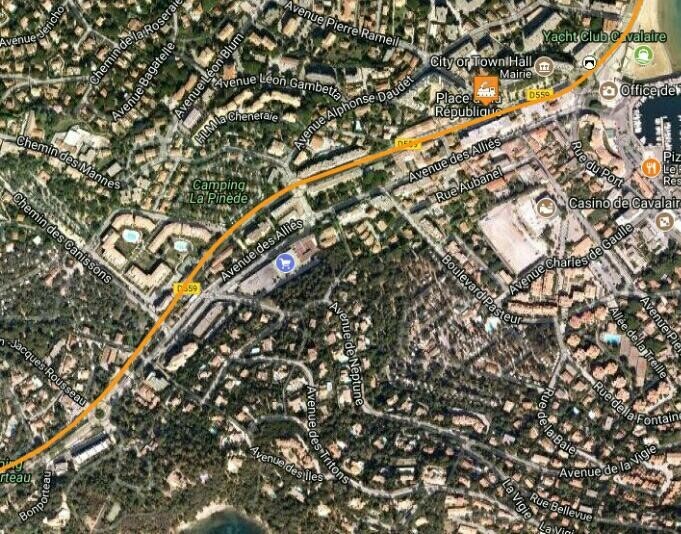 The 3rd Infantry Division landed on the left at Alpha Beach (Cavalaire-sur-Mer), the 45th Infantry Division landed in the centre at Delta Beach (Le Muy, Saint-Tropez), and the 36th Infantry Division landed on the right at Camel Beach (Saint-Raphaël). The landings were overwhelmingly successful. On Delta and Alpha beaches, German resistance was low. The Osttruppen surrendered quickly, and the biggest threat to the Allies were the mines. A single German gun as well as a mortar position were silenced by destroyer fire. 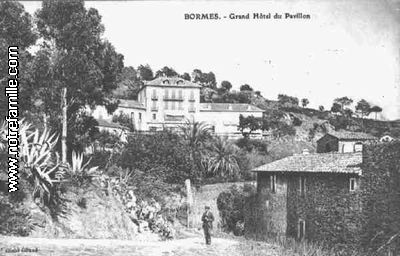 The Allied units in this sector were able to secure a bridgehead and quickly linked up with the paratroopers, capturing Saint-Tropez as well Le Muy. 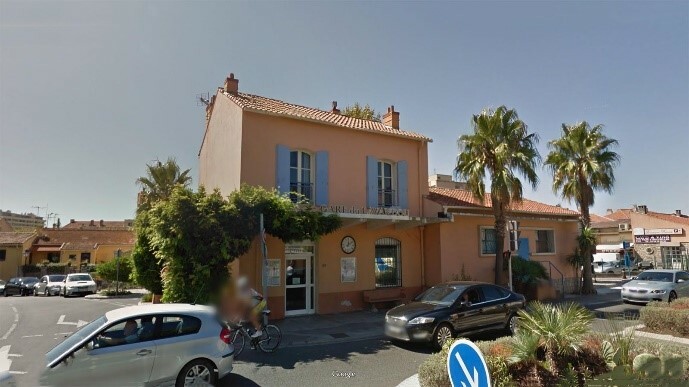 The most serious fighting was on Camel Beach near the town of Saint-Raphaël. This beach was secured by several well-emplaced coastal guns as well as flak batteries. Through heavy German fire the Allies attempted to land at the shore. However, at sector Red of the Camel Beach landing zone the Allies were not able to succeed. A bombing run of 90 Allied B-24 bombers was called in against a German strongpoint here. Even with the assistance of naval fire, the Allies were not able to bring the landing ships close to the shore. They decided to avoid Camel Red and land only at the sectors of Camel Blue and Camel Green, which was successful. The Allied casualties at the landings were very light, with only 95 killed and 385 wounded. 40 of those casualties were caused by a rocket-boosted Henschel Hs 293 guided gliding bomb launched from a Do-217 bomber aircraft by a rare appearance of the bomber wing KG 100, which sank the tank landing ship USS LST-282. In conjunction with the sea landing, airborne and glider landings (Mission Albatross followed by Mission Dove, Mission Bluebird, and Mission Canary) around the area of Le Muy were carried out. They were as successful as the beach landings, with only 104 dead, 24 of which were caused by glider accidents and 18 by parachute accidents. Operation Dragoon was considered a success by the Allied forces. 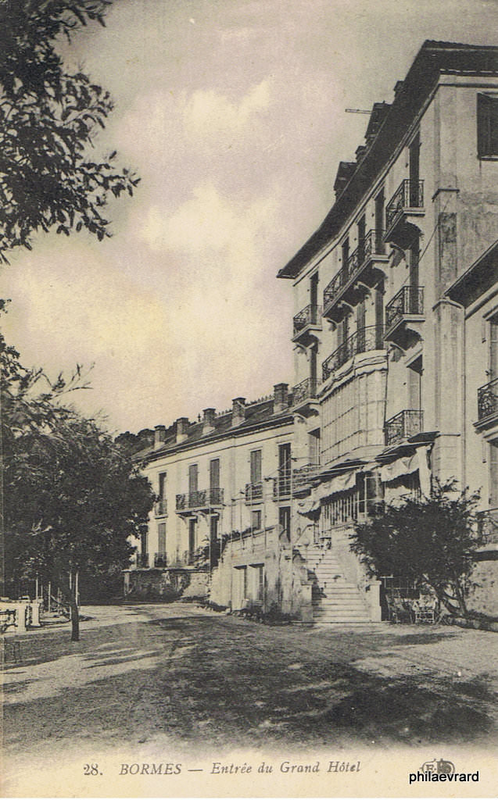 It enabled them to liberate most of Southern France in a time span of only four weeks while inflicting heavy casualties on the German forces. However, the Allies failed to cut off the most valuable units of the retreating Army Group G, which retreated over a distance of 800 kilometres (500 miles) in good order, into the Vosges mountains on the German border, with the capability of continuing the fight. The main reason for the failure to capture or destroy Army Group G was the Allied shortage of fuel, which began soon after the landing. The Allies had not anticipated the speed of their own advance and therefore could not adequately provide supplies and logistics to the leading Allied units. A significant benefit of Operation Dragoon was the use of the port facilities in Southern France, especially the large ports at Marseille and Toulon. After Operation Cobra and Operation Dragoon, the Allied advance slowed almost to a halt in September due to a critical lack of supplies. 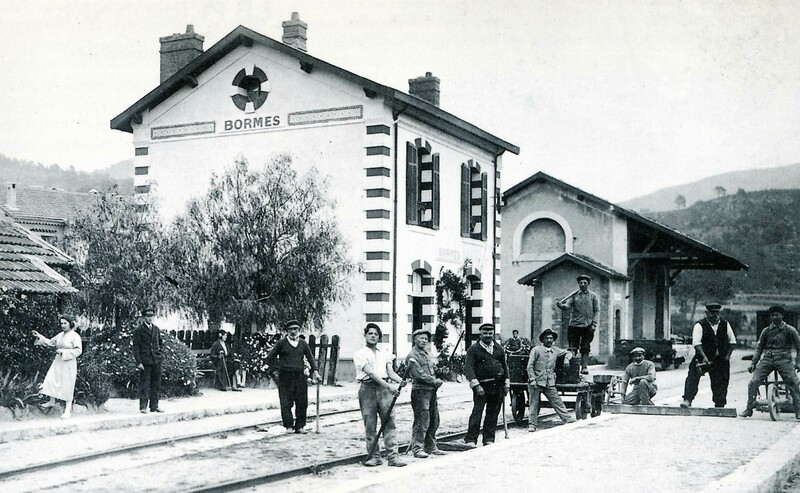 The ports were quickly brought back into service, together with the railroad system in Southern France. Thereafter, large quantities of supplies could be moved north to ease the supply situation. In October, 524,894 tons of supplies were unloaded, which was more than one third of the Allied cargo shipped to the Western front. 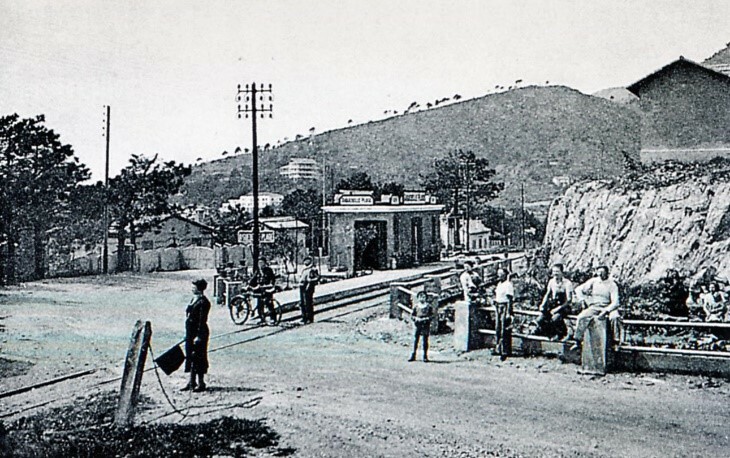 At the time of the great strike of 1910, 300 of the staff of the Littoral network stayed in work. 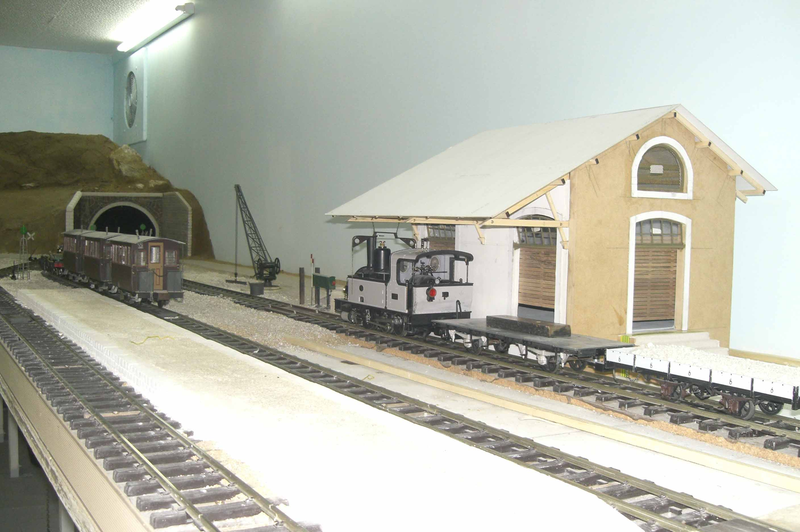 In this picture we see a maintenance gang waiting on Canadel platform. The locomotive is 4-6-0T Pinguely No. 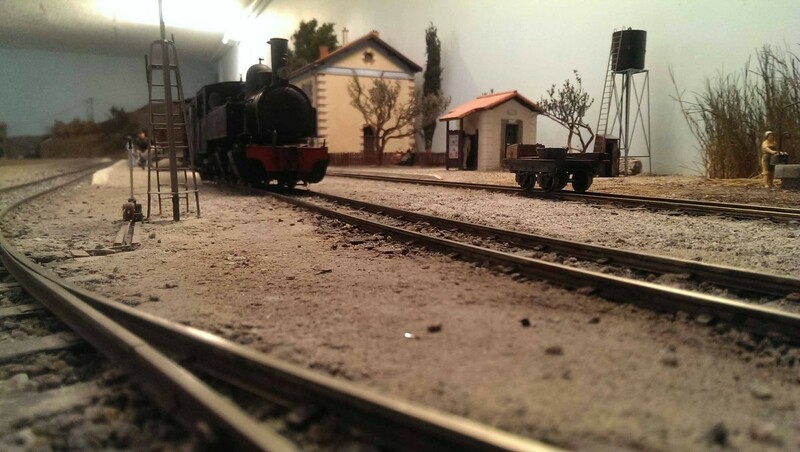 65 at the head of a mixed train (Edmond DUCLOS collection). 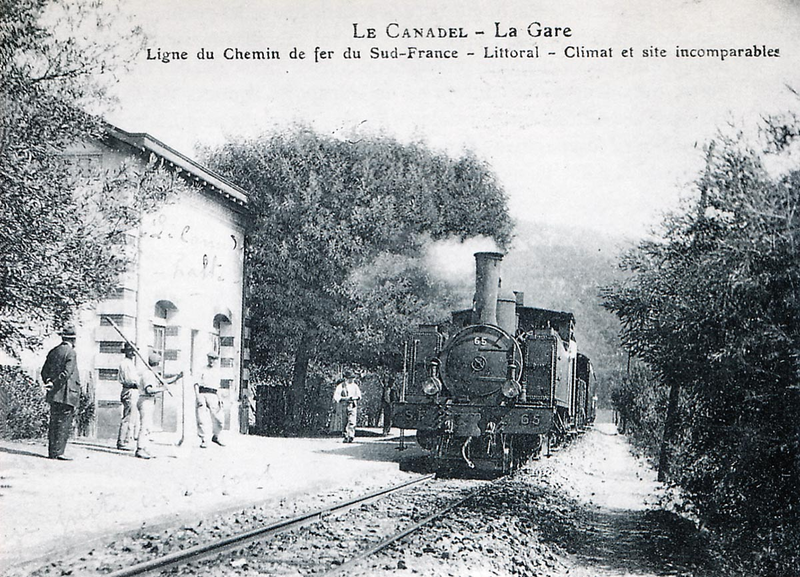 Leaving Canadel Halt behind, the line curves across the Ravin de Montanard on an embankment and follows the route of Chemin de la Tour des Sarazins, tracking Eat, then South and then turning sharply back to a North-easterly direction. 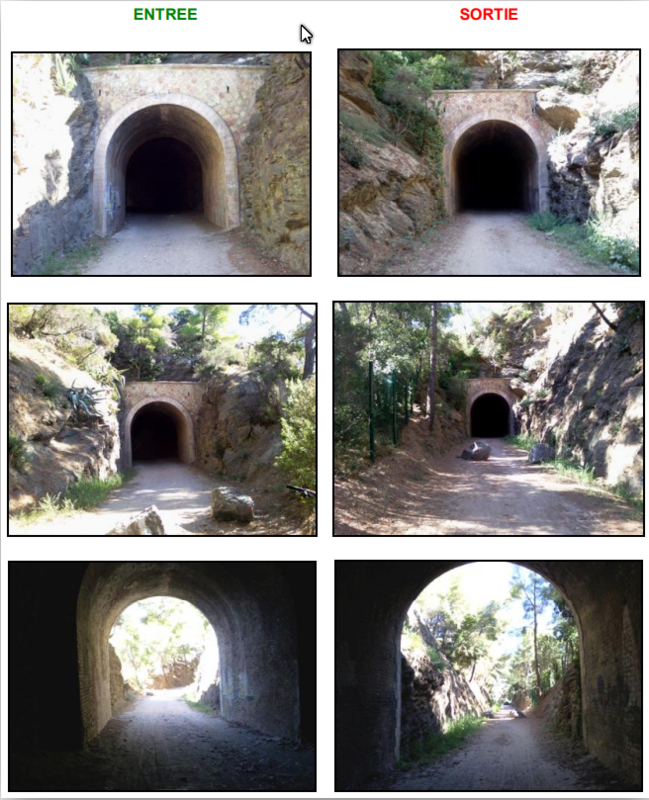 Just before turning north again the line passed through the 42 metre long, Tunnel de Malpagne (also known the Tunnel de Rayol), pictures of the tunnel are below. 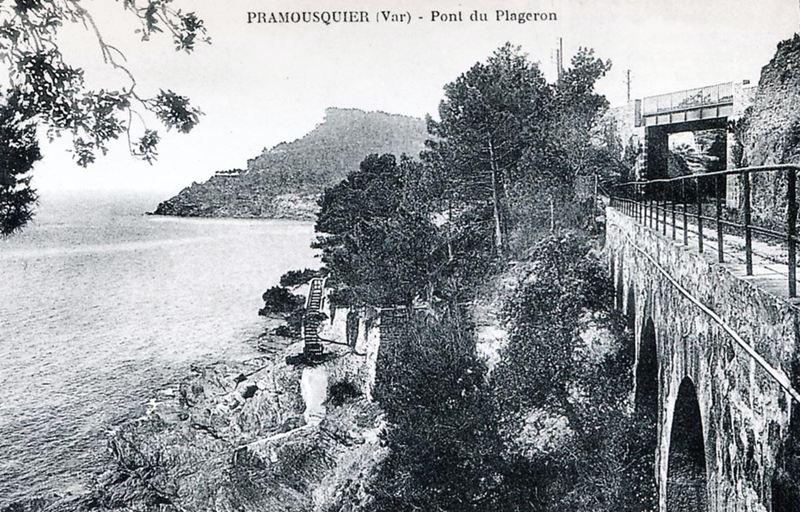 After leaving the Eastern portal of the tunnel, the line turned north-east to follow the coast-line round the Plage du Rayol, although, in order to maintain a level grade a more inland route was needed. 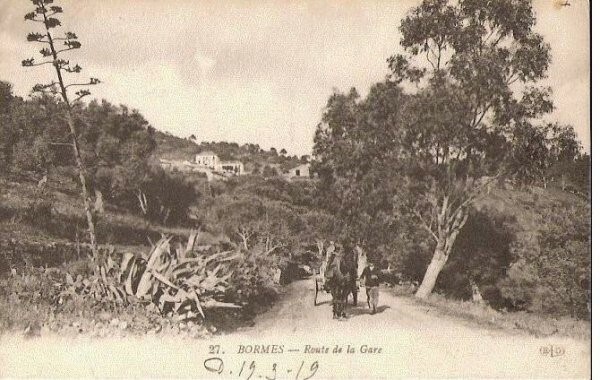 The railway followed the line of Le Battier and then Le Dattier cycleways, weaving back and forth so as to follow the contours of the hillside between the coast and the D559. 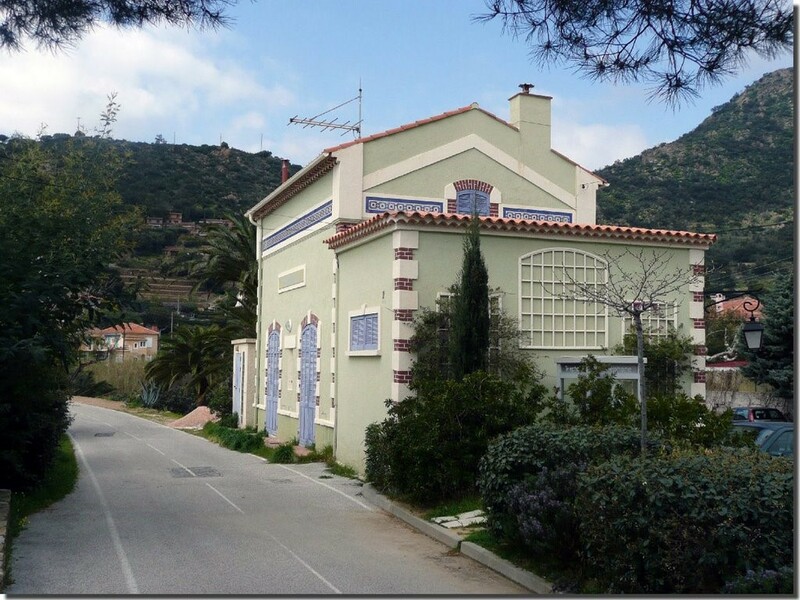 The next halt was Le Rayol which has been lost in more modern development. 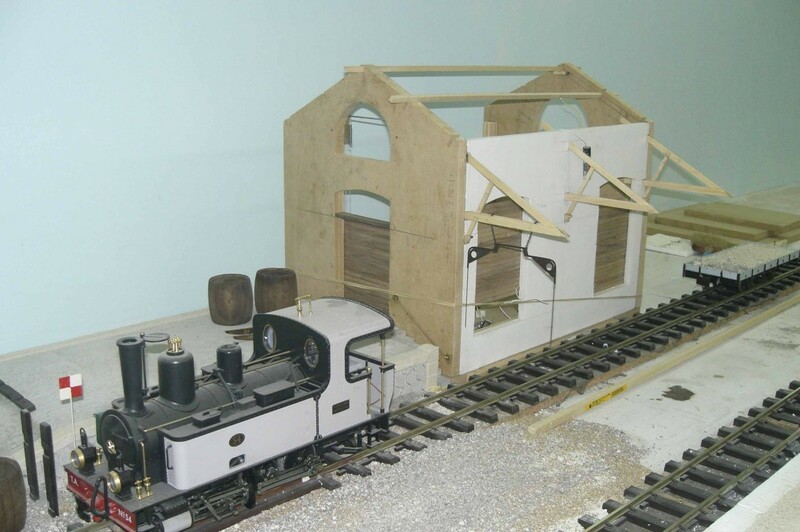 The Halt was rebuilt in 1935 after it had been destroyed by a tidal wave in the early 1930s! After Le Rayol the line continued along a path between the sea and the D559. Initially in open land and then in cutting. Avenue des Suisses crosses the line on a bridge whose parapets can just be made out in the second colour image. The formation is seen passing under the bridge in the third image. 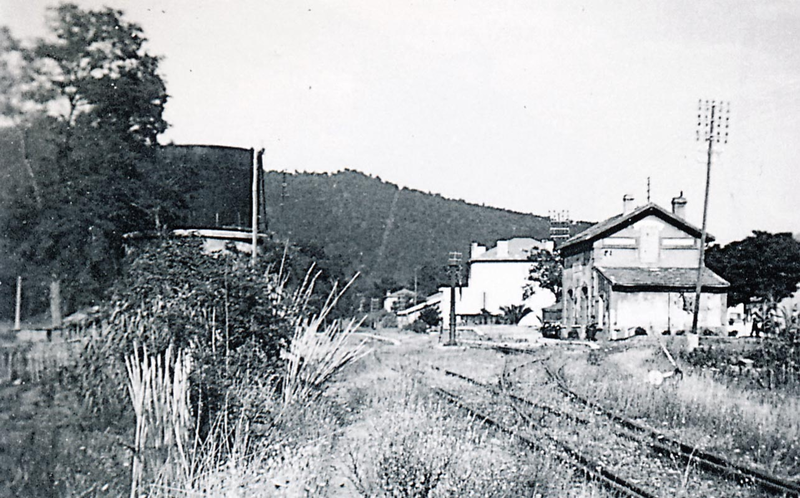 Then the line passed through another Halt, Le Dattier, seen in the next monochrome photograph in the 1970s (a picture taken by José BANAUDO). The builidng survives today. 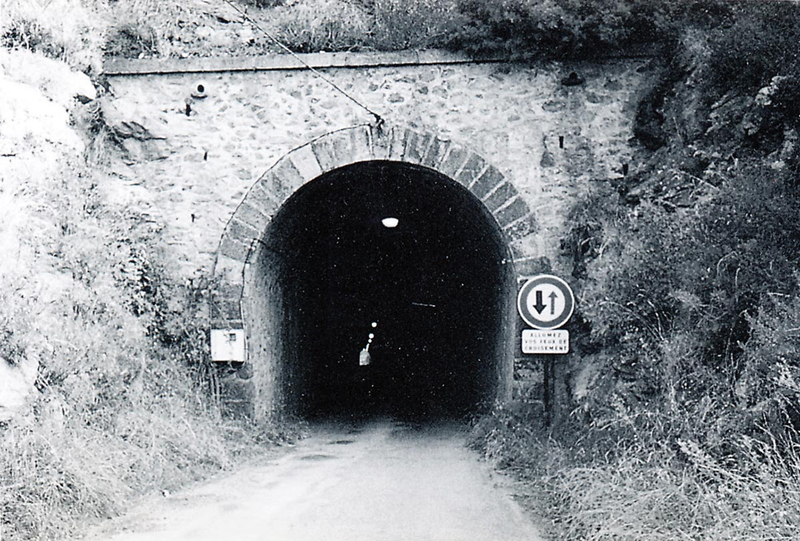 After Le Dattier, the line entered a longer tunnel – 245 metres long – Le Tunnel du Bonporteau. 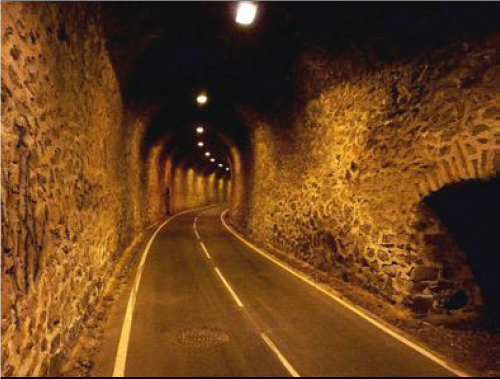 The tunnel is shown below. It ran on a North-east to South-west axis. Out the other side of the tunnel the line travelled in northeasterly direction, in cutting for a short distance and then across relatively flat ground before rising up on an embankment (now removed) before reaching the D559 which it crossed at high level on a metal girder bridge. All that remains of the structure now is the northern abutment. 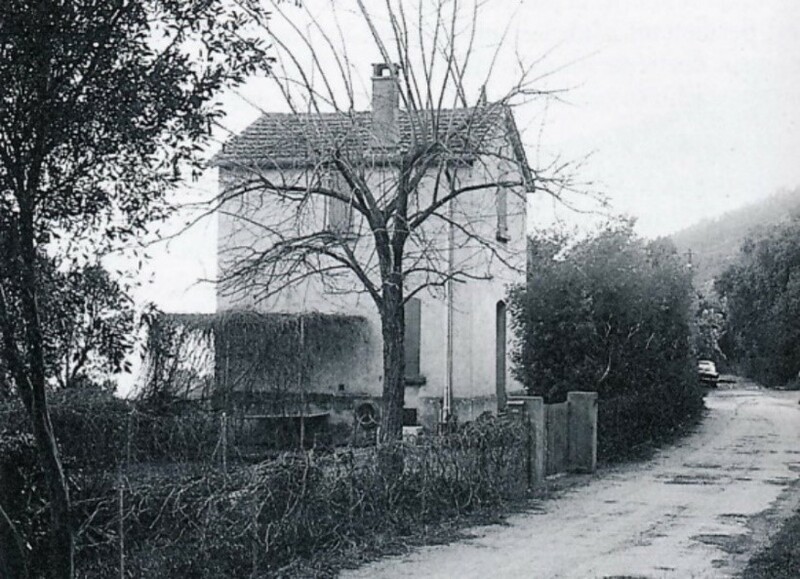 Immediately after crossing the road the line turned sharply to the East to run parallel to the road on its North side along Rue Rouget de l’Isle and then Chemin de Train des Pignes. The formation ran 2 to 3 metres above the level of the D559 as can be seen in the next image. The modern D559 rises to the level of the old railway formation by the time the next roundabout is reached. 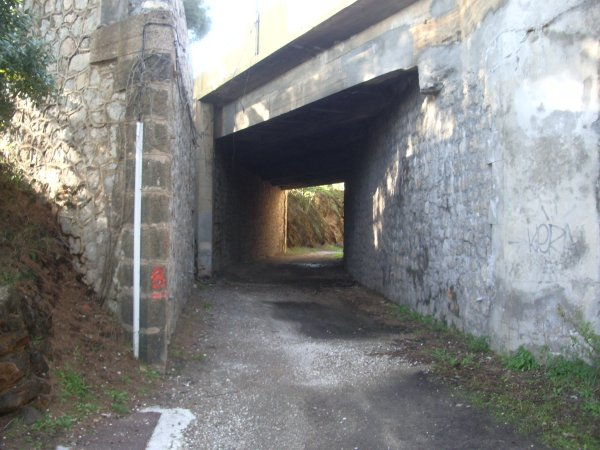 From this point on the D559 runs along the formation of the old railway into Cavalaire. The difference between the next two images is marked. The first shows Cavalaire just after the Second World War. The second is a similar view but taken in the early 21st Century. One is bucolic, the other heavily urbanised. 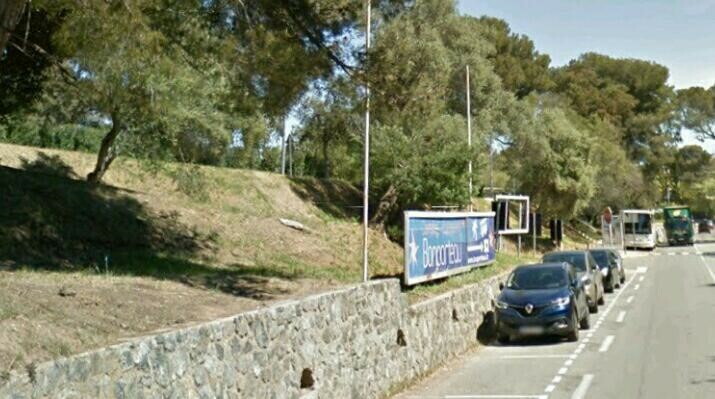 And so we arrive at Cavalaire, our next stop. Perhaps it is time to spend an hour or two on the beach before travelling on? Roland Le Corff; http://www.mes-annees-50.fr/Le_Macaron.htm, accessed 13th December 2017. Jean-Pierre Moreau; http://moreau.fr.free.fr/mescartes/ToulonGareSudFrance.html, accessed 24th December 2017. 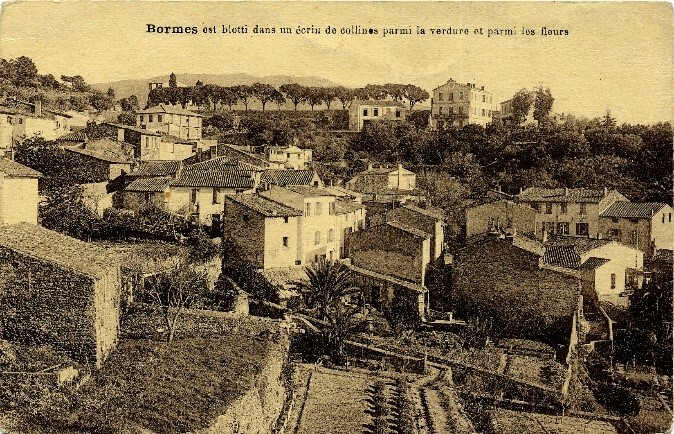 José Banaudo; Histoire des Chemins de Fer de Provence – 2: Le Train du Littoral (A History of the Railways of Provence Volume 2: The Costal Railway); Les Éditions du Cabri, 1999.
 https://blog.aboattime.com/sailing-to-france-bormes-les-mimosas, accessed 31st December 2017. 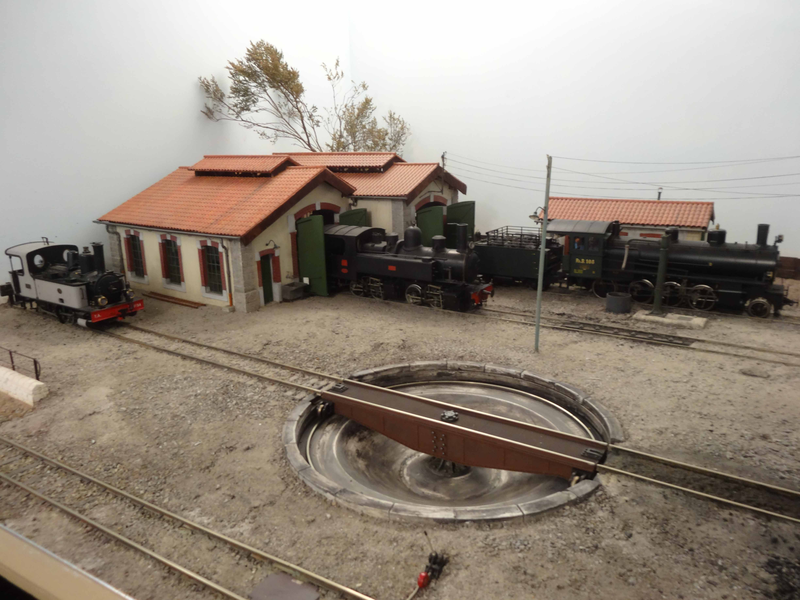 Henri Lacube; http://www.trains-littoral.fr, accessed 31st December 2017.
 http://www.tunnels-ferroviaires.org/tu83/83070.1.pdf, accessed 31st December 2017.
 http://www.tunnels-ferroviaires.org/tu83/83070.2.pdf, accessed 31st December 2017. Wikipedia; Operation Dragoon; https://en.wikipedia.org/wiki/Operation_Dragoon, accessed 30th December 2017. Steven J. Zaloga, Operation Dragoon 1944: France’s other D-Day. Osprey Publishing, p36-50, p71, 2009. Detlef Vogel, Deutsche und Alliierte Kriegsführung im Westen [German and Allied warfare in the West]. In Boog, Horst; Krebs, Gerhard; Vogel, Detlef. Das Deutsche Reich in der Defensive [The German Reich on the Defence: The Strategic Air War in Europe and the War in the West and East Asia 1943–1944/5]. Germany and the Second World War (in German). VII. Militärgeschichtliches Forschungsamt. Deutsche Verlags-Anstalt. p 419–642, 1983. 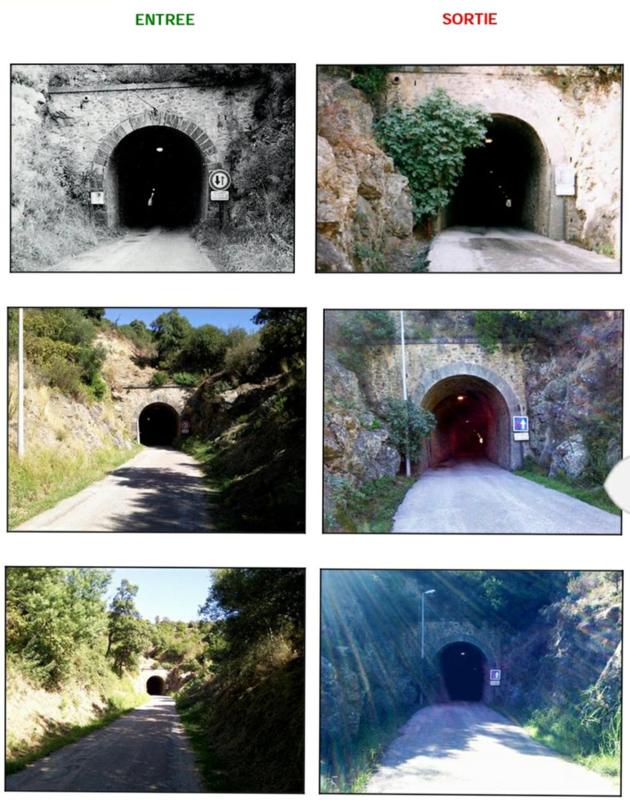 Anthony Tucker-Jones; Operation Dragoon: The Liberation of Southern France 1944; Pen and Sword, p175, 2010.
 http://www.tunnels-ferroviaires.org/tu83/83036.1.pdf, accessed 31st December 2017. 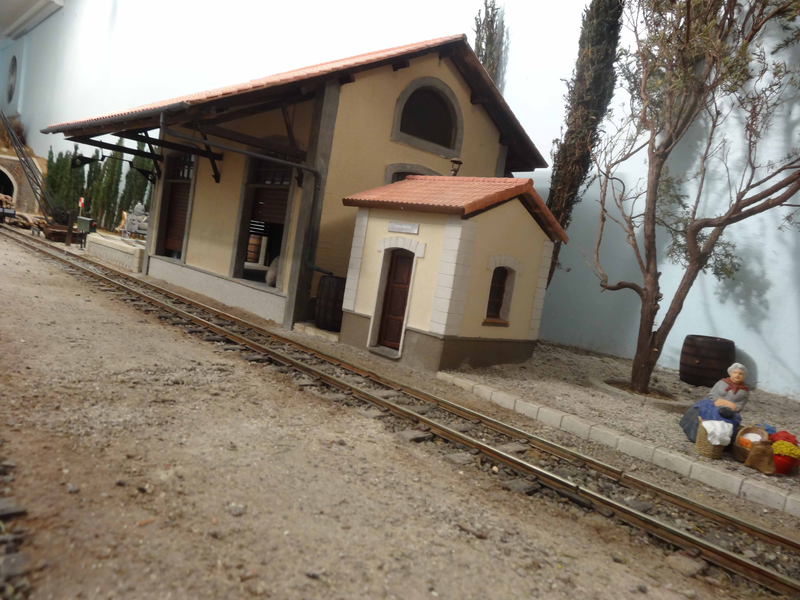 This entry was posted in Railways and Tramways Around Nice, Railways Blog on January 8, 2018 by rogerfarnworth.